The season is close. Very close. So for those of you who want to follow the team, prepare for the season, feed their excitement for the season, go to some games, watch some games, know what to look for, and have an easy page to reference, read on! This is an “article”, but it will also be posted as a PAGE on our website under the “2014-15 Schedule Guide” tab in our menu, so you can access it easily whenever you want! This post has game-by-game previews, as well as other information you might want. AND, of course, some jokes! Great, you chose to keep reading. Hope you enjoy, and remember, this is also a PAGE on our website for you to easily access at all times (on our menu tabs, you’ll see it)! Also, there are ticket links for each game, and I recommend using the specific links, but if you want one link with all of the games, you can go here. Also, when you’re looking for seats, it might be a good idea to contact us after checking out our links, because we might have an extra promo code or two. PRESEASON: (Oct 8 – Oct 24): Details about preseason at bottom of this article. REGULAR SEASON : HERE WE GO! Preview: Yeah, Sorry Chicago. Melo wasn’t going anywhere. 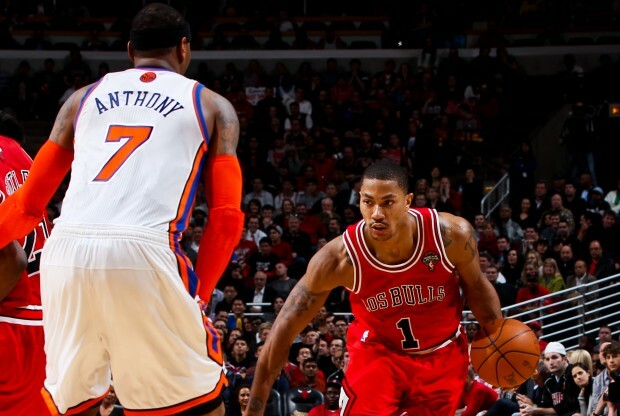 But Derrick Rose will (allegedly) be back, and he’ll be determined to show Carmelo what he’s missing out on. The Knicks will have the home-court advantage in this matchup, but it should be tough and physical, and a very, very tough first test for new coach Derek Fisher. Notes: Nationally televised. Tickets expensive. 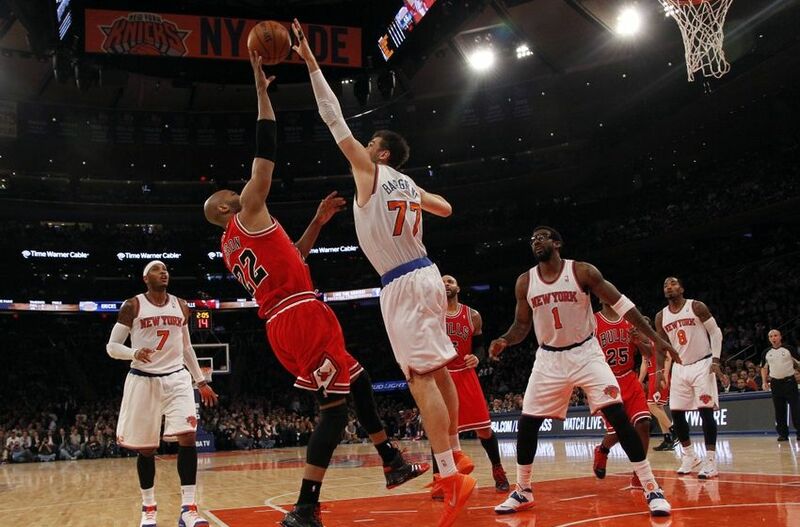 Bulls made playoffs last year, split season series with Knicks 2-2. Chicago’s only visit to MSG this season. 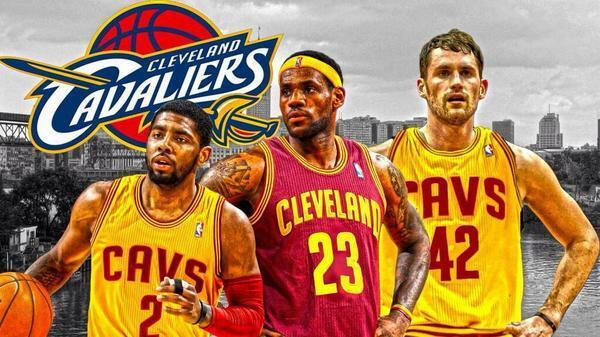 Preview: Guys, the Cavs are totally my sleeper pick to win the title this year. Wait, what? They don’t count? Darn. Well anyway, they won the lottery again (no comment), which helped them lure in LeBron James and Kevin Love to put next to Kyrie Irving. HOW DOES THAT EVEN HAPPEN? Anyway, this will be the first home game for the newly loaded Cavs, and the Arena should be packed with former Heat fans. The Knicks will have a very tough time in this game, especially since they will be playing 2 games in 2 nights, in 2 cities, against 2 great teams. 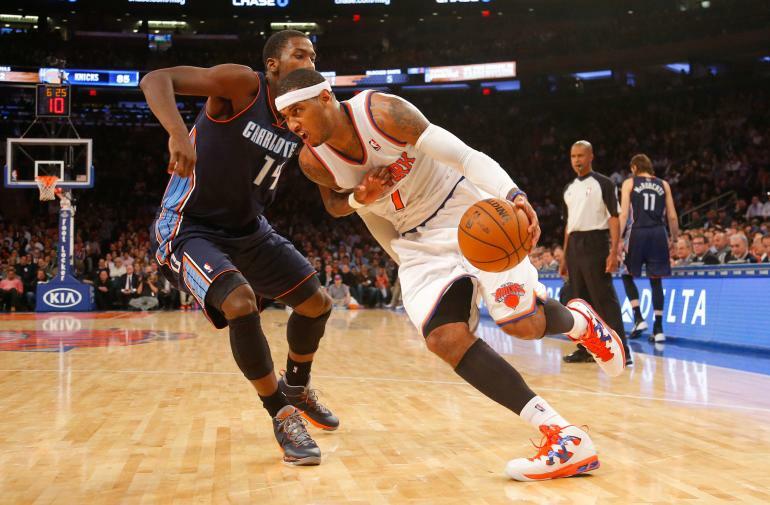 Carmelo will need help from his teammates in this one. Notes: Nationally televised. Tickets through the roof. Cleveland missed playoffs last year, and split the season series with the Knicks 2-2, but those stats are irrelevant in this case, for obvious reasons. Notes: Nationally televised (NBA TV). Tickets cheaper. Charlotte made the playoffs last year. Teams split season series 2-2. Preview: The Wizards had a great season last year, and handed us some of our most frustrating losses, including the game where Mike Woodson didn’t call time-out. Washington won both of the games at MSG by one point. John Wall is lightning quick, so the Knicks had better hope their perimeter defense has improved over last season. Felton is gone, so there’s that. This will be an interesting test: a game against a solid but non-elite team. Notes: Tickets cheaper. Washington made the playoffs and swept season series 3-0. 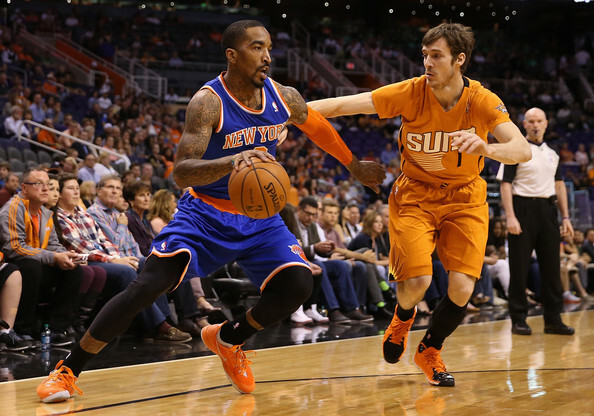 Preview: This will be a battle of wits between JR Smith and Josh Smith. Imagine two llamas playing chess. But this is a game the Knicks should win, and the kind of game they have to win if they want this season to be different from last year’s debacle. Oh yeah, Sheed is an assistant coach for Detroit. THE RETURN! Notes: Tickets cheap, of course. 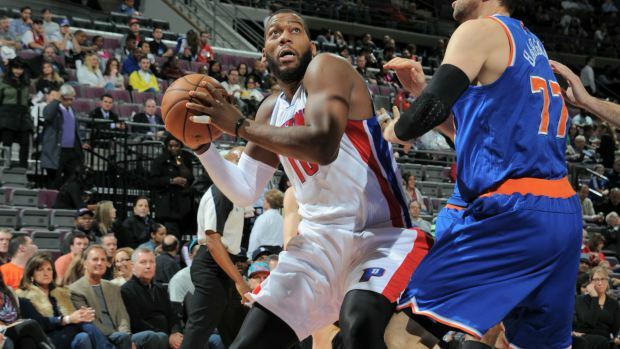 Pistons missed playoffs, won season series 2-1. 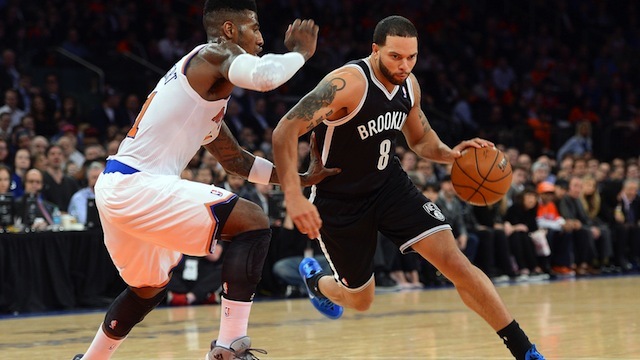 Preview: The Nets will host the first battle between the NYC rivals. Brooklyn lost Paul Pierce and a few solid role players over the summer, but they should have Brook Lopez back on the court in what should be a fun game between two teams looking to take the division crown away from the Raptors. The Knicks and Nets played a few blowout games last year, so I’m not sure whether we should expect a nail-biter, or a laugher. But no matter what the margin is, this game could go either way. Notes: Tickets fairly expensive. Nets made the playoffs last season. Knicks won season series 3-1. Preview: Well, we all hate the Hawks now. Atlanta barely beat out the Knicks for the final playoff spot last season, thanks in large part due to one matchup in which the Knicks let a huge lead slip away and handed the Hawks a victory. 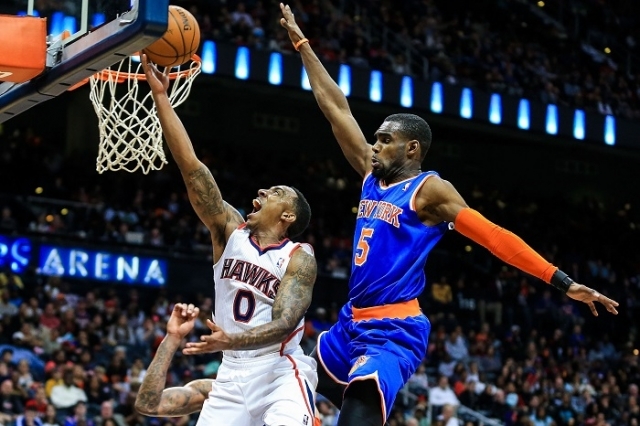 The Knicks are probably the more talented team, although the Hawks will be getting Al Horford back. 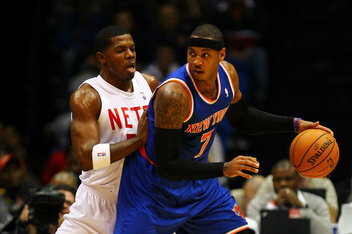 Can the Knicks avenge themselves in this first matchup? Notes: Tickets cheap. Hawks made playoffs last season. Season series split 2-2. Preview: Gotta love those home & home battles. Right after squaring off down south, the Knicks and Hawks will head back up to New York, with one team looking to complete a sweep and the other looking to avenge a loss. It’s usually tough for a team to win both of these games, so let’s see what happens. Notes: Nationally televised game. Tickets cheap. Hawks’ only visit to MSG this season. Preview: One of the Knicks’ more infuriating losses came in a double-overtime contest in Orlando, and games like that one helped keep New York out of the playoffs. This is a game the Knicks have no business losing, but they won’t be able to coast to a win, if the past is any indication. Notes: Tickets cheap. Orlando missed playoffs last season. Knicks won season series 2-1. Preview: The Jazz have a lot of fun, young players, including Enes Kanter, Dante Exum, Derrick Favors, Alec Burks, Trey Burke, and Gordon Hayward (who was selected with a draft pick the Knicks had traded away). They were quite bad last season, but they have the potential to be good before too long. This should be an entertaining one to watch, and it’s a game the Knicks should definitely win, especially considering that they have won 6 straight against Utah. OH, ALSO, STEVE NOVAK RETURNS TO THE GARDEN! Notes: Tickets cheap. Jazz missed playoffs last year. Knicks swept season series 2-0. Utah’s only visit to MSG this season. Preview: This is always an entertaining matchup, thanks to all the players involved who have played for both of these two teams. Carmelo faces his old squad, Gallo, Wilson, Nate, and Mozgov return home, and the Nuggets have JaVale McGee, which could lead to some extra entertainment. Mark this one on your calendars. Notes: Tickets cheap. Nuggets missed playoffs last season. Teams split season series 1-1. Denver’s only visit to MSG this season. Preview: The Bucks had the worst record in the NBA last year, got bought by a couple New Yorkers, got screwed in the lottery by the Cavs, stole Jason Kidd from the Nets in hilarious fashion, and are ready to try to start building around Jabari Parker and Giannis Antetokounmpo. Giannis’ brother Thanasis is on the Knicks’ D-League team, so if New York’s second pick of the draft is on the NBA roster by the time these teams square off for the first time, that will definitely be fun to watch… and hard to spell. Also, this game might help me win a free hat, which would be dope. Notes: Tickets hilariously cheap. Milwaukee is an interesting place. Bucks missed playoffs last year. Knicks won season series 3-1. Preview: This was going to be a game full of Kevin-Love-to-the-Knicks hype, but since the Wolves traded their superstar for Andrew Wiggins, the Knicks will go up against the #1 overall pick one night after taking on the #2 selection. Seeing Rubio throw lobs to Wiggins will be entertaining… provided that the Knicks don’t let those two pull it off too often. Notes: Tickets cheap. Wolves missed playoffs last season. Season series split 1-1. 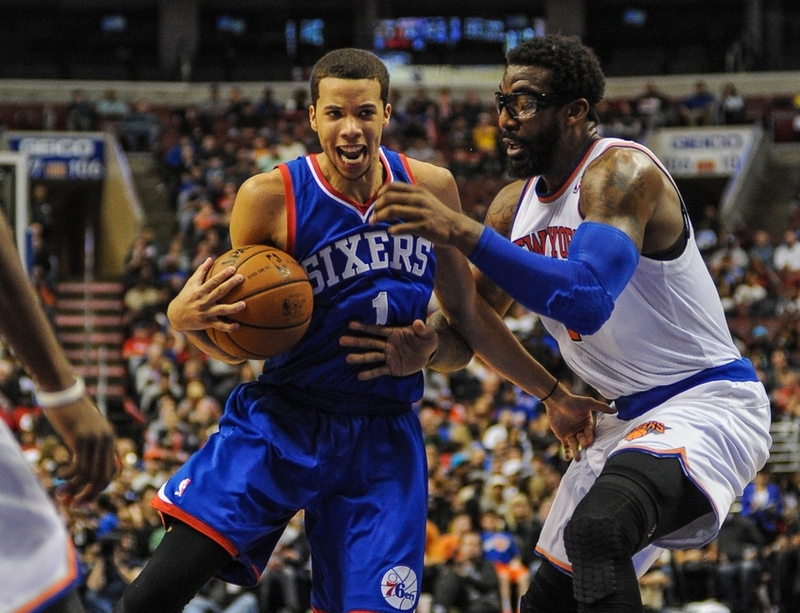 Preview: The Sixers are terrible, and that’s the way they want it, at least for now. Joel Embiid won’t play, but Nerlens Noel should, as he puts his high-top up against Iman Shumpert’s. Notes: Tickets expensive, for some reason. Sixers missed playoffs last season. Knicks won season series 3-1. Preview: New York’s visit to Houston last year ended with JR Smith taking a shot with plenty of time to spare and the shot clock turned off in a tie game, which led to JR getting some serious hate from his own fans. But it was a close game, as was the matchup at MSG between the two teams. The Rockets tried unsuccessfully to lure Carmelo Anthony, as well as every other big free agent. They did land Trevor Ariza, but Chandler Parsons bolted for Dallas, Omer Asik was shipped off, and Jeremy Lin was sent packing to LA. There will be a lot of talent on the floor in this game regardless, and it should be a high-scoring affair as Melo tries to triumph over Harden and Howard on the road. 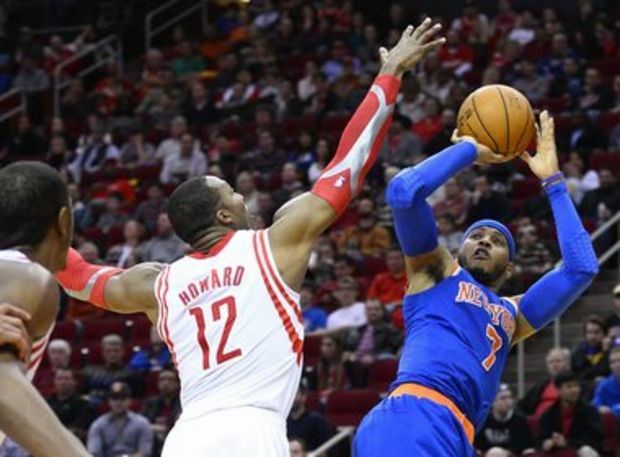 Houston has beaten the Knicks in 9 straight contests, so this won’t be easy. Notes: Tickets cheap. Rockets made playoffs, and swept season series last year. 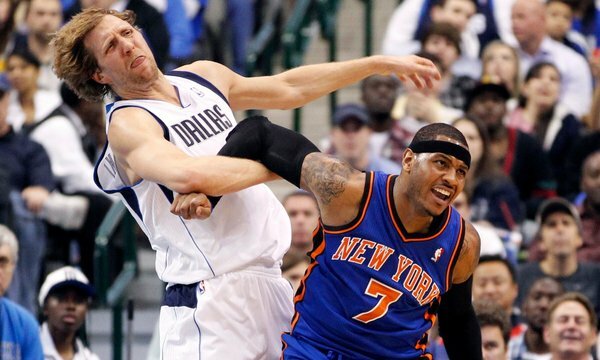 Preview: The Knicks and Mavericks made a big trade over the summer, so this game will be a story of reunions. Tyson Chandler and Raymond Felton will be looking to beat their old team, but so will Jose Calderon, Shane Larkin, and Samuel Dalembert. The Mavericks made some intriguing moves this offseason and their offense should be dynamic with Dirk, Monta, and Parsons leading the way. 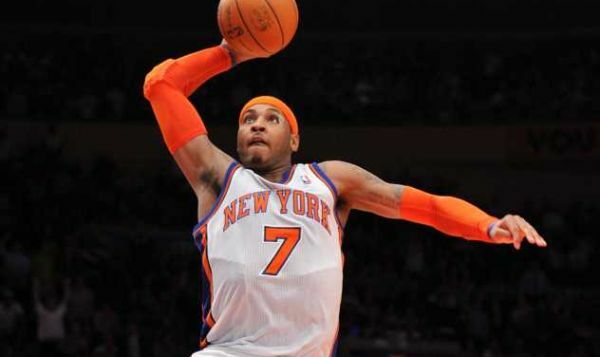 New York will be looking to avenge last year’s loss at the Garden, which ended on a buzzer-beater from Nowitzki. Notes: Nationally televised game. Tickets cheap. Mavericks made playoffs last season. Season series split 1-1. Preview: The top two scorers in the league will face off in this matchup, which will be an extremely tough one for the Knicks on the road against an OKC team that should seriously contend for a title this season. 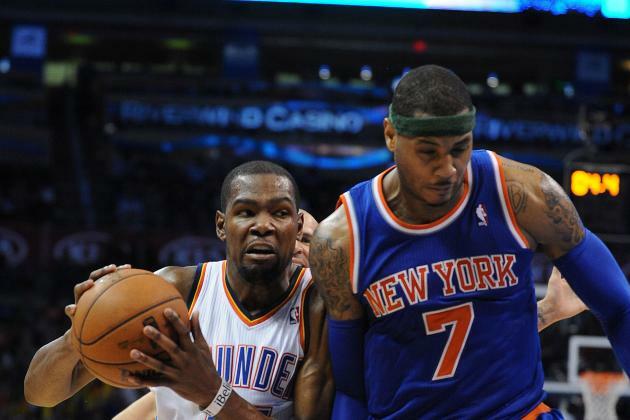 Durant has an edge over Anthony, and has much more support, with Russell Westbrook and Serge Ibaka on his side. The Knicks will need great execution to have a chance in this one. Oh, and this is fun: Derek Fisher will be coaching against the guys he PLAYED with last season. Notes: Tickets moderate. OKC made playoffs and swept season series 2-0 last year. Preview: The unthinkable happened this summer, as LeBron James turned the tables on the Heat by bolting Miami for Cleveland. But the Heat retained Dwyane Wade and, surprisingly, Chris Bosh, while adding Luol Deng, Josh McRoberts, Danny Granger, and Shabazz Napier. The Knicks fared pretty well against the Heat during the LeBron era, despite usually being overmatched on paper. The teams are more even now, and while the Heat will probably be the favorites, expect a hard-fought battle between the two rivals. Notes: Tickets expensive. Miami made NBA Finals last season, won season series 3-1. Preview: The bitter rivals will fight their second battle of the season in early December, with the Knicks acting as the hosts this time around. These games are always huge for bragging rights, so this matchup definitely one to look forward to. Notes: Tickets expensive. Knicks 90-85 all-time vs Nets. Preview: LeBron, Love, and Irving will hit the Garden for the first time as teammates in this game, and will probably have boos rained down on them from the start, as all three Knicks targets committed their futures to the Cavs over the summer. Cleveland is the favorite, of course, so the Knicks will have to dig deep to reward the fans who pay the exorbitant prices being charged to see this one. Notes: Nationally televised game. Tickets through the roof. Knicks 108-83 all-time vs Cleveland. Preview: The Knicks will once again follow up a battle against Cleveland by going up against Charlotte, this time heading on the road to face Al Jefferson and his Hornets. Will this be a bounce-back opportunity coming off of a harsh loss, or a potential trap game coming on the heels of a great win? Notes: Tickets cheap. 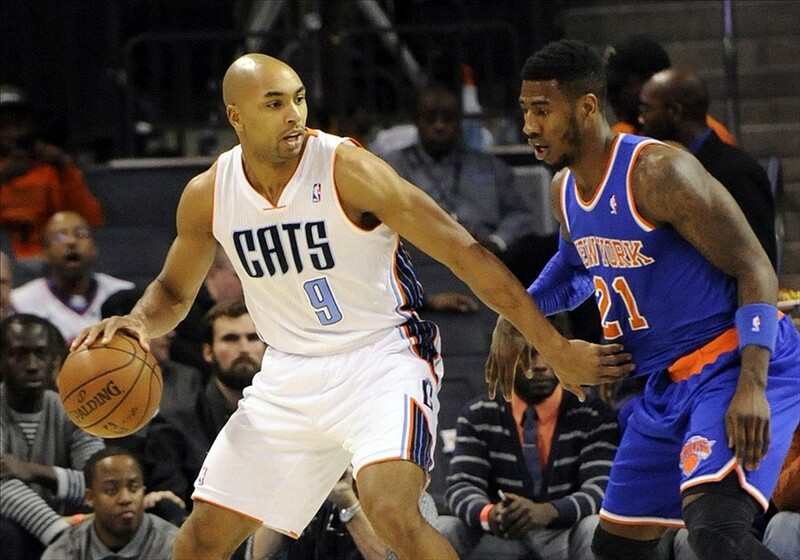 Knicks 52-38 all-time against Charlotte. 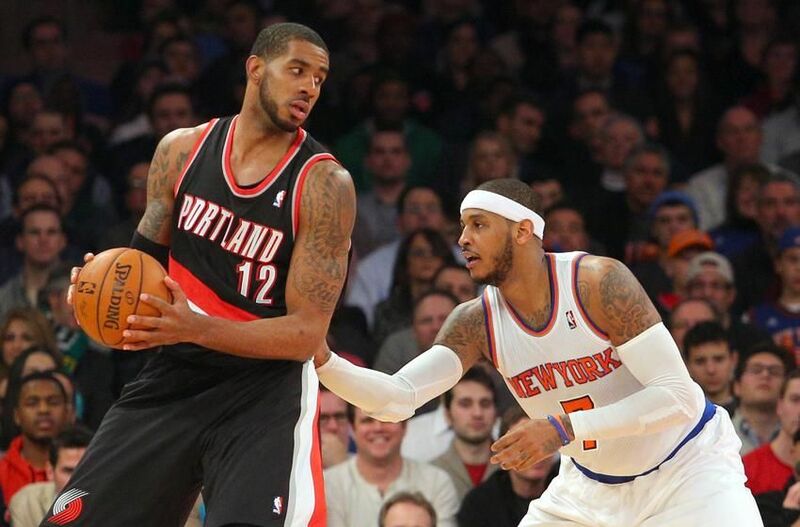 Preview: The home crowd will probably be trying to lure LaMarcus Aldridge to New York in this game, but with Aldridge apparently planning on re-upping with Portland after the season, it seems like a bit of a pipe dream. The Knicks themselves will have no time for recruiting, as they will have their hands full with Aldridge and Damian Lillard. New York’s defense will be tested both inside and out all game long. Notes: Tickets pretty expensive. Blazers’ only visit to MSG this season. Portland made playoffs and swept season series 2-0 last year. Preview: Is “Anthony” better as a first name or a last name? Watch this game to find out! 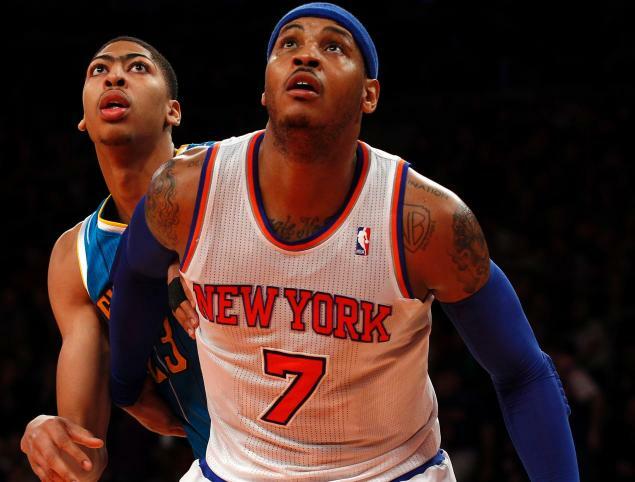 Carmelo will try to lead his team to victory over a quietly dangerous Pelicans team led by the budding, unibrowed superstar Davis. The Brow is flanked by Tyreke Evans, Eric Gordon, Jrue Holiday, Omer Asik, and Ryan Andersen, so the Knicks will have to play as a team to get a victory here. Notes: Tickets cheap. Pelicans missed playoffs last season. Season series split 1-1. Preview: The Knicks had one of their best wins of the season when they visited San Antonio last year, but it’s hard to forget the savage beatdown the eventual champions gave us on our home floor. The Spurs will almost surely bring nearly flawless preparation and execution, and they’re quite talented as well. 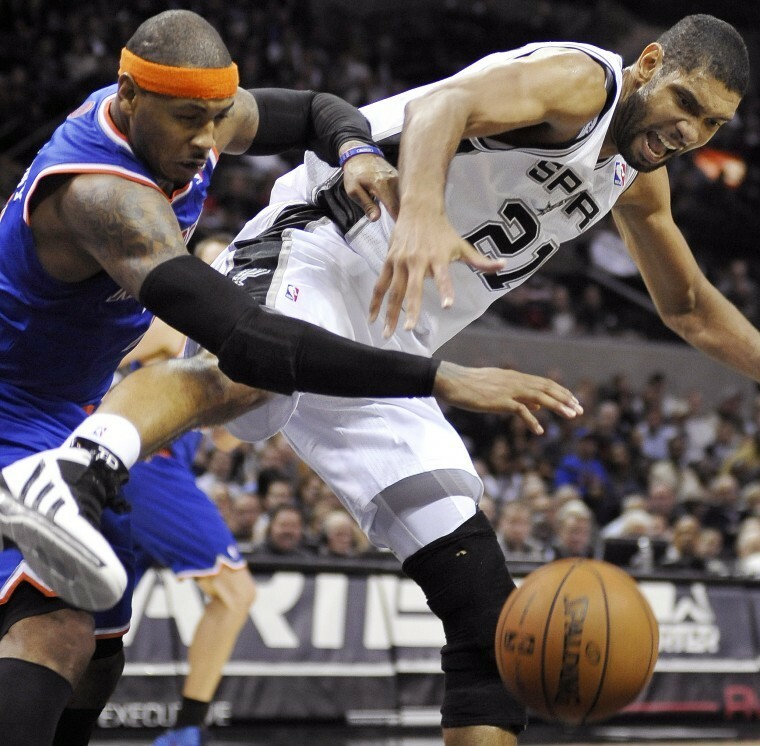 The Knicks have played well against the Spurs recently (for the most part), but San Antonio is obviously the favorite here. Notes: Nationally televised game. Tickets cheap. Spurs won NBA Championship last season. Season series split 1-1. Preview: Boston will host the first regular-season matchup of the season between these two rivals. While each team took a pair of games against the other last season, the 41-point massacre at the Garden still haunts Knicks fans at night. It would be nice to see New York return the favor, but the Knicks would gladly settle for a win of any kind in this game, although they will be the favorite. Notes: Tickets moderate. Boston missed playoffs last year. Season series split 2-2. 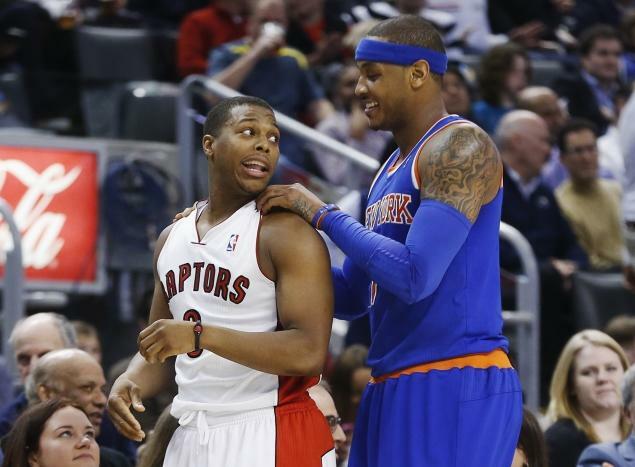 Preview: The Raptors stunned the Knicks, and everybody else, by winning the Atlantic Division last season. New York will try to reclaim its title, and would greatly help its cause by winning the head-to-head matchups with Toronto. 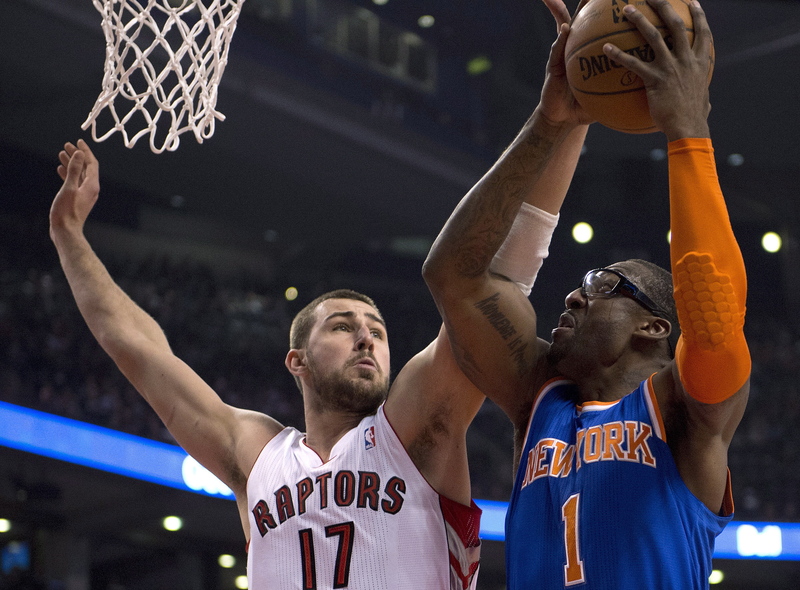 The Raptors seemed to outhustle the Knicks at times last season, and Derek Fisher can’t let that happen this time around. The Knicks will be tested on the perimeter against Kyle Lowry and DeMar DeRozan, but this is a winnable game, and an important one at that. Notes: Tickets moderate. Raptors made playoffs last season. Season series split 2-2. Notes: Nationally televised game. Tickets fairly expensive. Mavericks’ only visit to MSG this season. Knicks 32-34 all-time against Dallas. Preview: This is the first time Bulls Fans Who Totally Didn’t Want Melo Anyway will get a chance to boo Melo after recruiting him last season. Chicago is the favorite here, but these teams usually play close games, so the Knicks have a chance. Will Rose still be healthy by game 28? I’ll be bold and say Yes. Notes: Nationally televised game. Tickets moderate. 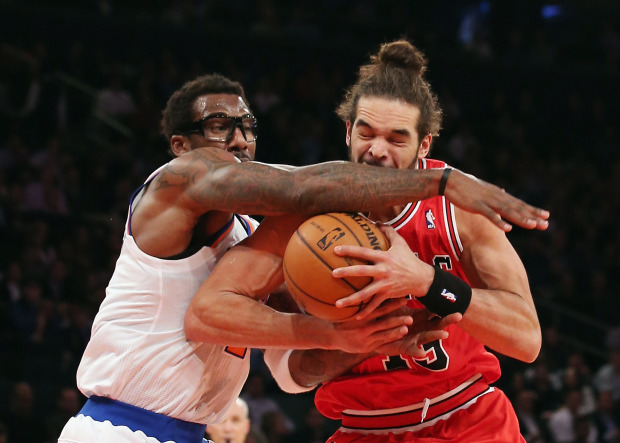 Knicks 98-114 all-time vs Bulls. 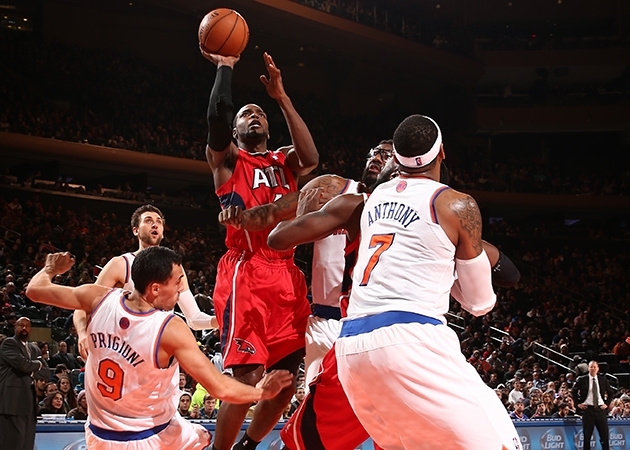 Preview: Last time the Suns came to the Garden, Raymond Felton hit a huge 3 and the Knicks won in overtime. Goran Dragic is a guy the Knicks could very well target in the offseason, so expect the MSG crowd to show him a little love in this game. The Suns will have Eric Bledsoe and Isaiah Thomas (no, not that one) on board as well, so the Knicks will be dealing with a very dangerous backcourt. Notes: Tickets fairly expensive. Suns’ only visit to MSG this year. Suns missed playoffs last season. Season series split 1-1. 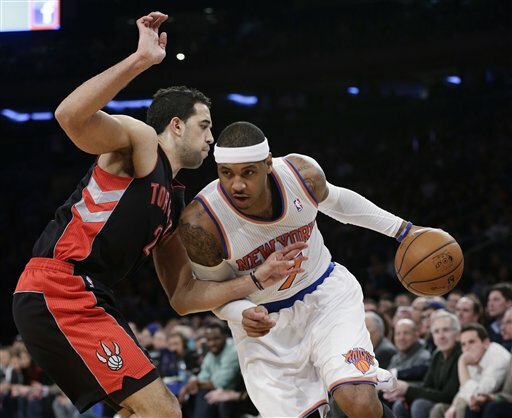 Preview: The Knicks will be heading north of the border for this game, and the Toronto fans will be able to boo Andrea Bargnani to their hearts’ content, although José Calderon could get a warm reception. Notes: Tickets cheap. 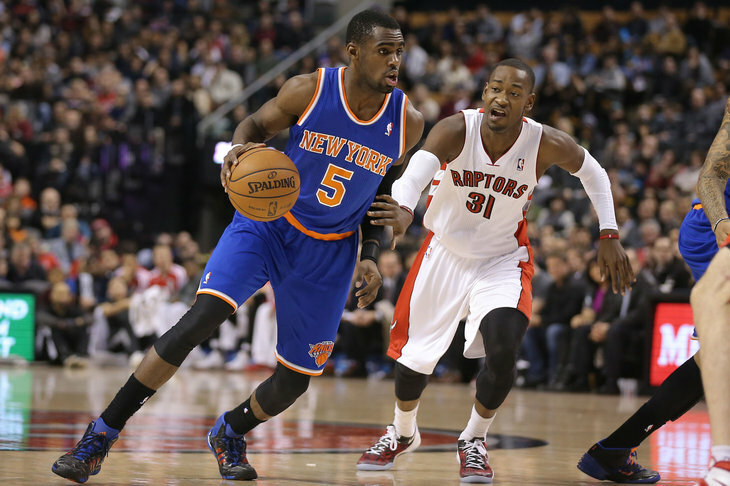 Knicks 38-35 all-time against Toronto. 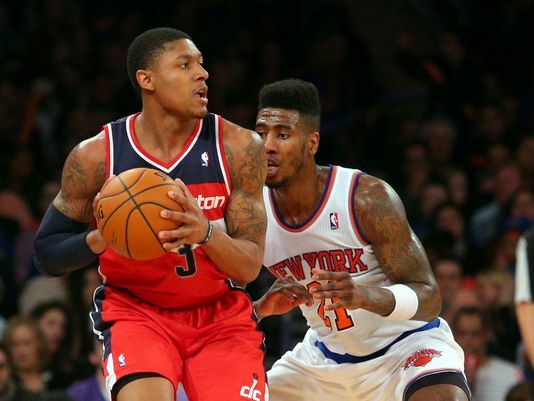 Preview: The Knicks have been playing on Christmas Day a lot lately, and they will have another go at it this year as they host the Wizards. JR Smith is probably on the naughty list, but hopefully the rest of the team has been good enough to get a win from Santa in this game. Good thing we don’t have Metta anymore. Notes: Nationally televised game. Tickets very expensive. 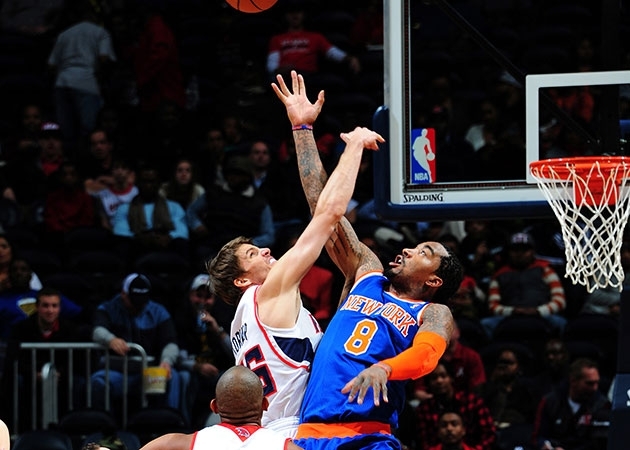 Knicks 167-116 all-time vs Wizards. Preview: The Knicks got beaten by Jimmer Fredette in an overtime contest at MSG last year, but won the matchup in Sacramento. The Kings are a pretty weak team, so the Knicks will be hoping to sweep them this year, and that quest will start with this game on the road. 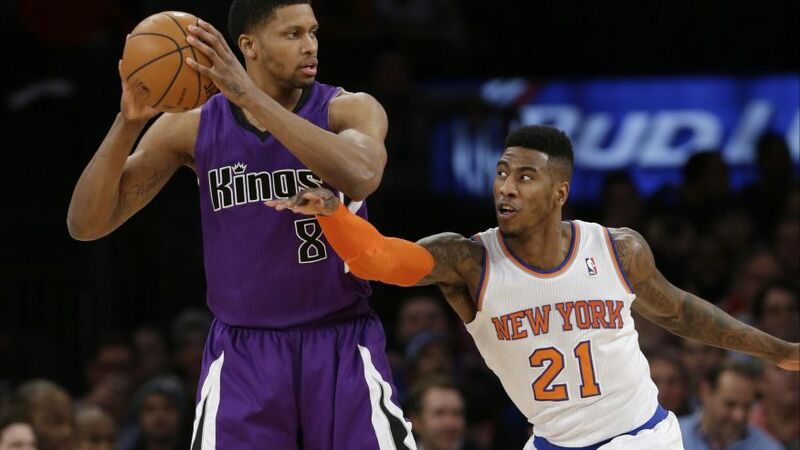 DeMarcus Cousins and Rudy Gay are quite good, but the Kings don’t have much depth; this is a game the Knicks should win. Quincy Acy and Travis Outlaw will be facing their former teams, but the Kings cut both of the guys they got back in this summer’s trade (Jeremy Tyler and Wayne Ellington). Notes: Nationally televised game. Tickets moderate. Kings missed playoffs last season. Season series split 1-1. 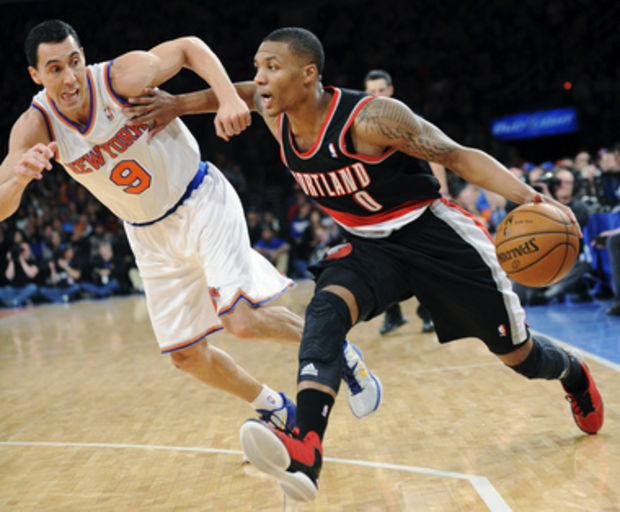 Preview: The Knicks will continue their West Coast trip with a Sunday night game out in Oregon against Aldridge and the Blazers. They’ll be playing the second game of a back-to-back, which is especially tough after such a long trip to get to the Pacific. This game, sandwiched between a very winnable matchup and a very, very tough matchup, could be the difference between a winning road trip and a losing one. Notes: Tickets cheap. 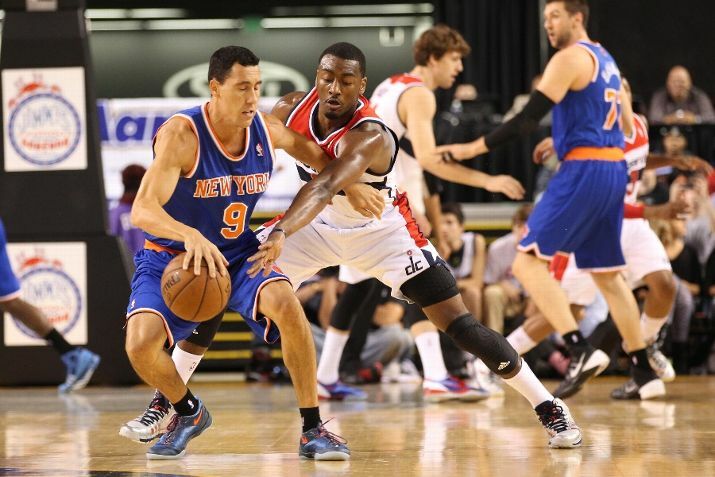 Knicks 45-58 all-time vs Blazers. Preview: This is the aforementioned very, very tough matchup, and the Knicks will need to pull out all the stops to have a chance against CP3 and Blake Griffin’s Clippers. 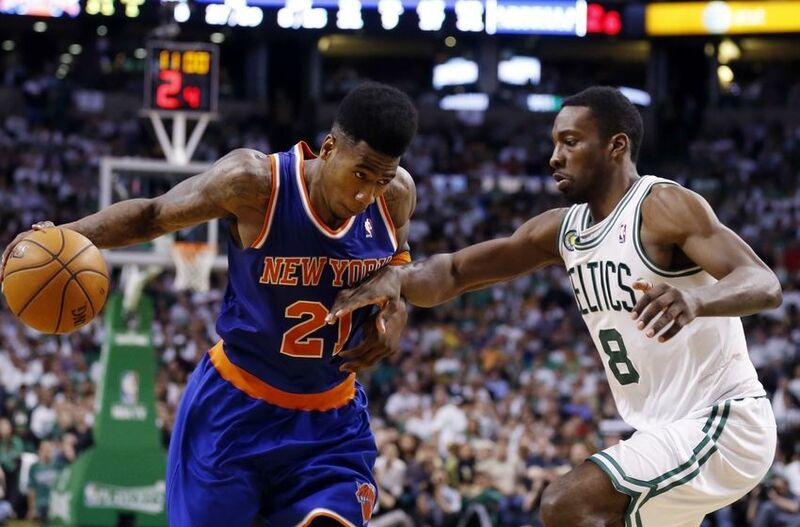 If the Knicks get sloppy and loose on defense, Paul will pick them apart with ease. 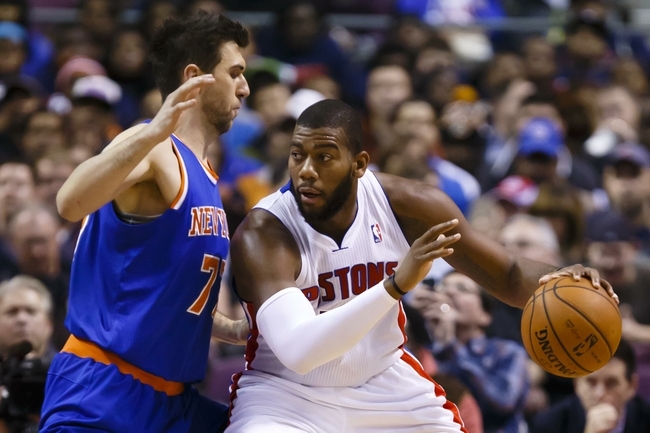 Preview: The Knicks will kick off the new year on their home court against Andre Drummond and the Pistons. If the Knicks don’t hustle and box out, Drummond (and Monroe, and Smith) will eat them alive on the boards all night long. If the Knicks come to play, it’s a game they should definitely win. Notes: Tickets moderate. Knicks 201-162 all-time vs Pistons. 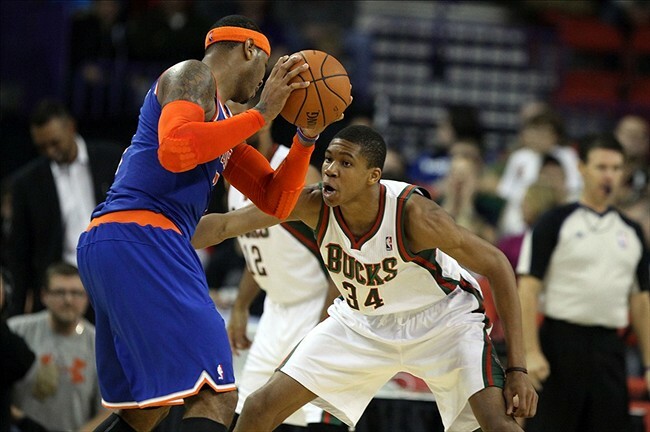 Preview: This Knicks-Bucks matchup, the first that will be played at the Garden this season, has a much better chance of being an “Antetokounmpo Bowl.” If the Bucks are healthy, they could give the Knicks a fight (don’t forget our embarrassing loss to them last season) but the Knicks will definitely be playing one of their most favorable matchups of the season in this game. Notes: Tickets fairly cheap. Knicks 98-97 all-time vs Bucks. 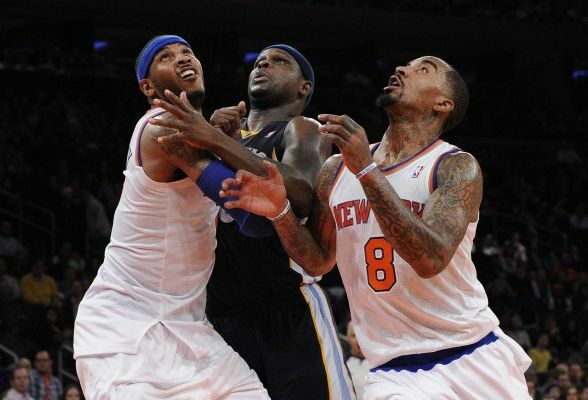 Preview: The Knicks will be heading down south a bit to take on the Grizzlies in Memphis for this game, and will have their hands full on the interior with Former Knick Zach Randolph and Potential Future Knick Marc Gasol, not to mention the opposition they will face on the perimeter in the form of Mike Conley. Notes: Tickets cheap. Grizzlies made playoffs and swept season series 2-0 last season. Preview: The Knicks will be in the nation’s capital for the first time this season when they visit the Wizards on January 7th. This game comes in between two tough Western matchups, so the Knicks had better make sure to play with focus in this contest, or else they’ll be in danger of finding themselves mired in a losing streak. Notes: Tickets cheap. 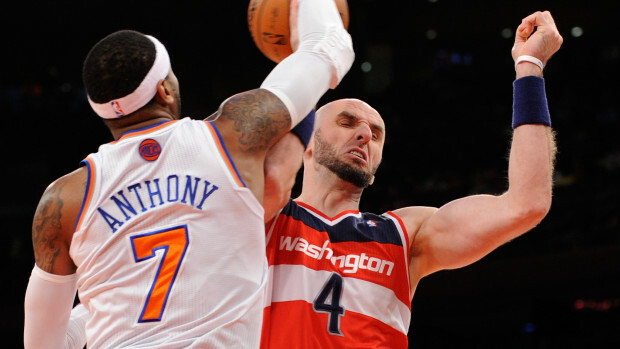 Wizards have won 3 in a row 4 out of last 6 after Knicks won 10 straight head-to-head. Preview: This is one of the more exciting home games of the season, as three superstars will be involved. 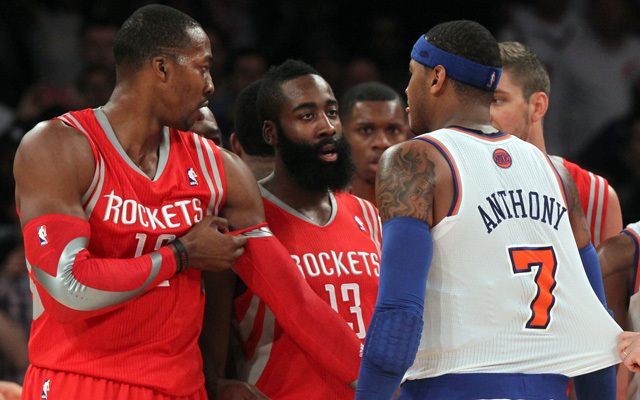 Last year’s battle at MSG was close and controversial (remember Melo’s 4-point play getting waived off?) but the Rockets have dominated this matchup in recent years, so the Knicks will either be trying to snap a long losing streak or looking to complete a statement sweep of the season series. Andrea Bargnani did solid work defensively on Howard last season, so Knicks fans certainly be hoping for (if not expecting) more of the same. Notes: Nationally televised game. Tickets fairly expensive. Rockets’ only visit to MSG this season. Knicks 69-64 all-time vs Houston, lost to them in 1994 NBA Finals. Preview: This is one of the most important games of the season. Why? BECAUSE NEW YORK KNICKS MEMES WILL BE LEADING A GROUP OF 126 RABID KNICKS FANS TO THE GARDEN, THAT’S WHY. And also, because every game counts. Yeah. Also, we have one ticket left for that outing, so if you message us on Facebook, it could be yours. Consider it your reward for making it this far in the article. Notes: Tickets fairly cheap. Knicks Memes group outing. You’ll hear us from your TV. Discounted Tickets: We will have tickets SOON, British Fans! Notes: Game will be played in London. Knicks 1-0 in London. Undefeated! Ticket updates coming shortly. Nationally televised game. Preview: After their visit to London, the Knicks will be back in the Freedom Capital of the World for this game, where they will host Davis, Holiday, Gordon, Evans, Andersen and their friends at the Garden in the traditional MLK day MSG matinee. 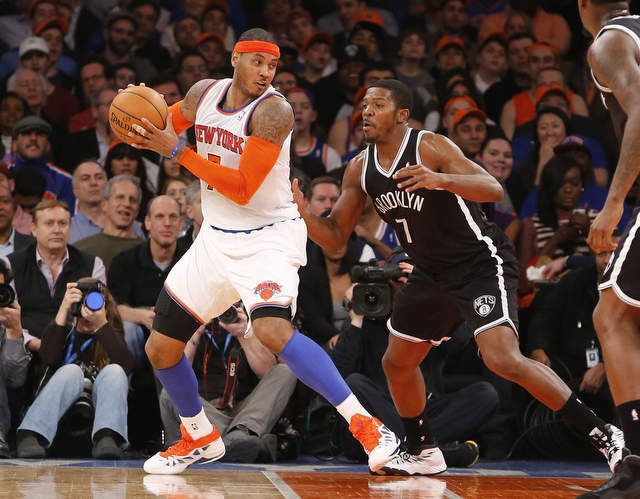 New York will be hoping to get off to a positive start in the 2nd half of the season. Notes: MLK Day. 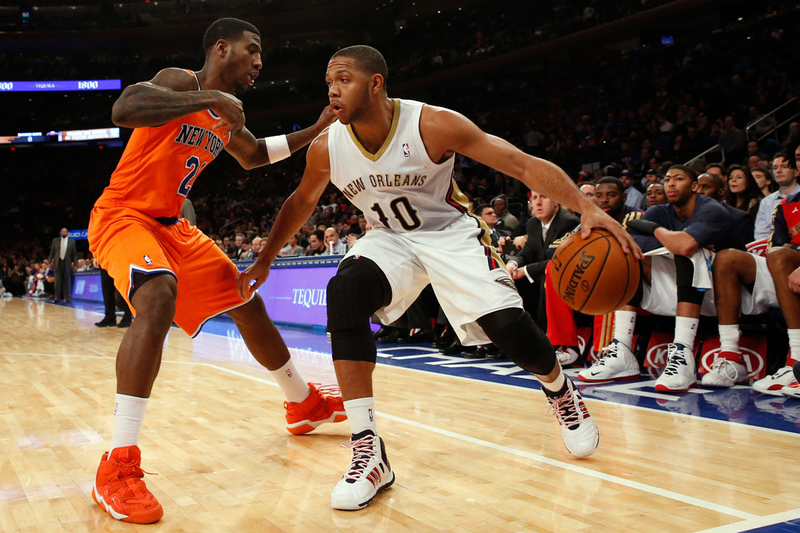 Pelicans’ only visit to MSG this season. Knicks 13-13 all-time against Pelicans. Preview: As somebody who goes to college in Philly, I definitely have this one circled on my calendar. The Knicks will presumably be the only team trying to win this game, so any other result would be a disappointment. Notes: Tickets cheap. 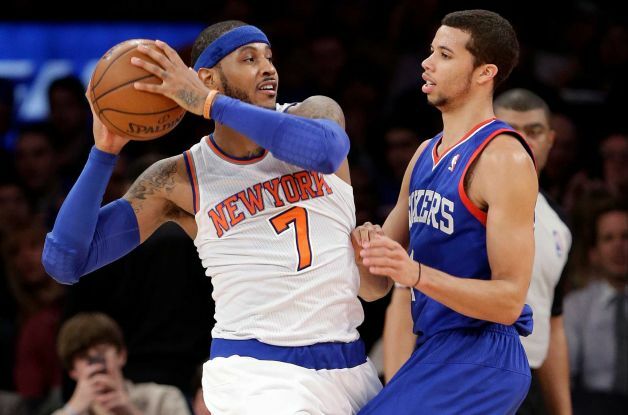 Knicks 192-241 all-time vs 76ers. Preview: This very favorable portion of the Knicks’ schedule will continue when they play the Magic on a Friday night at MSG. The Knicks will be looking to pad their record here and give themselves a cushion in the standings for when they play tougher teams. Notes: One of the cheapest home games of the season. 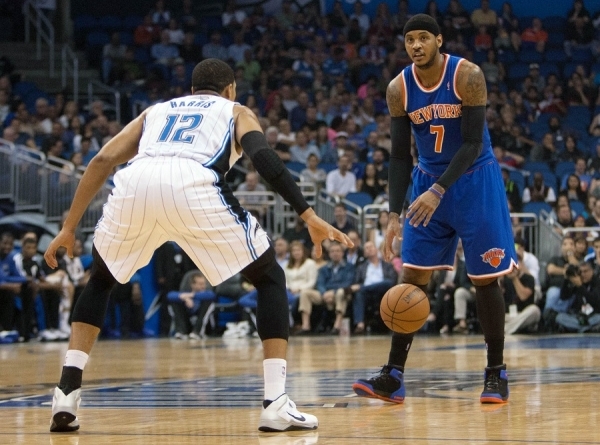 Knicks 47-48 all-time vs Magic. Preview: Live from North Carolina, it’s Saturday Night! 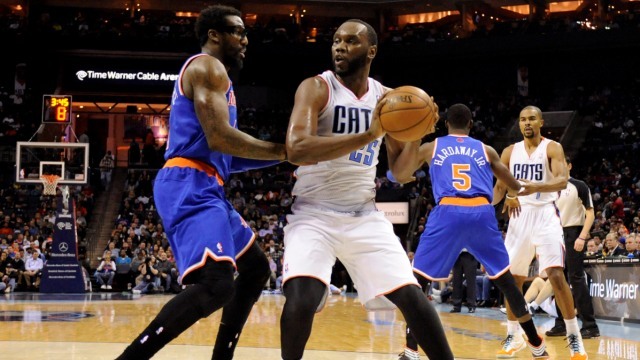 The Knicks and Hornets will wrap up their 4-game season series with this battle in Charlotte. Notes: Nationally televised game. Tickets expensive. Preview: This is another very winnable game for the Knicks, but last year’s Knicks-Kings game at MSG ended in bitter disappointment. If the Knicks find themselves looking ahead to their next game, they could find themselves behind on the scoreboard when the final buzzer sounds. Notes: Tickets cheap. Kings’ only visit to MSG this season. 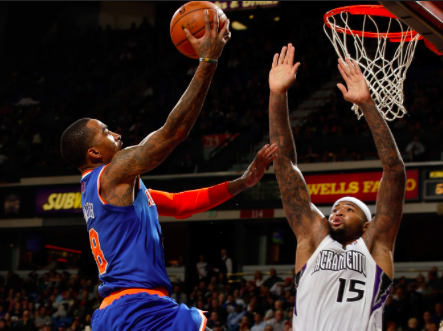 Knicks 141-149 all-time vs Kings. Preview: The string of easy games ends here. The Knicks got slaughtered at home on Christmas Day by OKC last year and will look to put up a more respectable performance at home this time around. But who will step up and make that happen? Notes: Nationally televised game. Tickets expensive. Thunder’s only visit to MSG this season. Knicks 63-59 all-time vs Thunder. Preview: If you’ve made it this far, you’ve probably been wondering how the Knicks will have gone this long without playing the Pacers. Their first matchup will come near the end of January, in the same place where the Knicks played their last postseason game. Paul George is hurt, Lance Stephenson is gone, and the jury is out on Roy Hibbert. The Pacers could be pretty mediocre. Or they could be pretty good. We’ll definitely know more by the time this game rolls around. Notes: Nationally televised game. Tickets very cheap. Pacers were #1 seed in East last year, won season series 2-1. Preview: One of the low points of the Knicks’ season last year was their brutal beatdown in Los Angeles to a Kobe-less Lakers team. But Kobe is back, and will be playing one of his final games at Madison Square garden. The Knicks will have revenge on their minds, and while Kobe won’t have Pau Gasol, he will have former Knick Jeremy Lin on his side. Lin’s career-defining game came during a Lakers-Knicks contest at MSG a few years ago, so we’ll see how he does now that he’s on the other side. Another guy who’s switched sides recently? That Phil Jackson fellow. Notes: Nationally televised game. Tickets expensive. Lakers’ only visit to MSG this season. Lakers missed playoffs last season. Season series split 1-1. 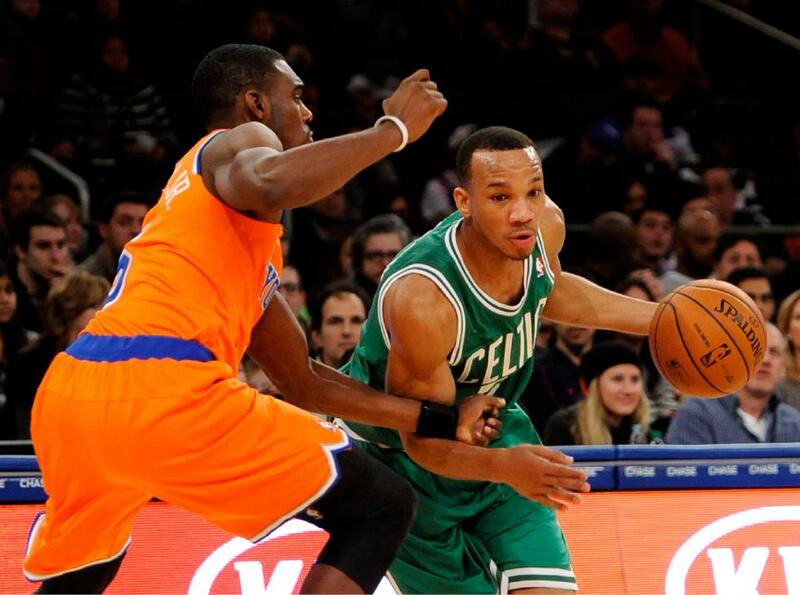 Preview: The Celtics will wait until February to make their first visit to MSG. 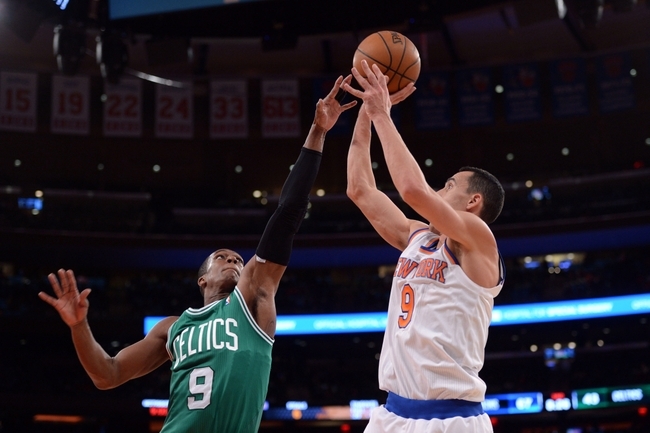 Knicks fans might find themselves recruiting Rajon Rondo, who will hit the market this summer. And the 41-point debacle must be avenged. The Celtics must pay in spades. SPADES, I SAY! Notes: Tickets fairly cheap. Knicks 177-278 all-time against Celtics. 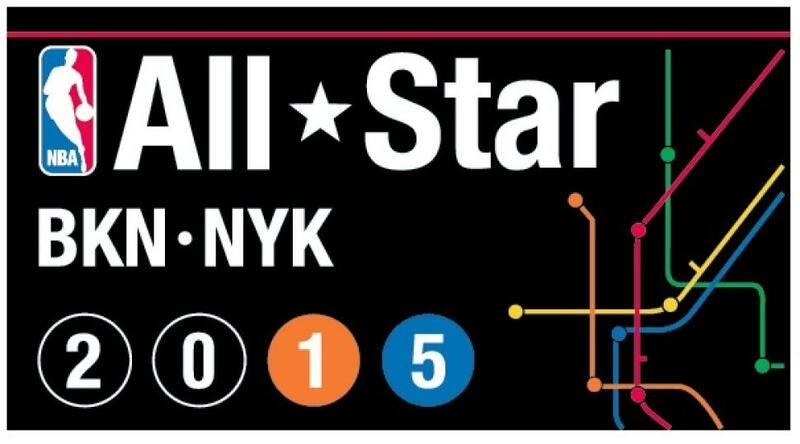 Preview: The third matchup of the Subway Series will be fought in Brooklyn, a week before the teams combine to host the All-Star Game. There won’t be any room for fun and showboating in this one, though. Notes: Nationally televised game. Tickets fairly expensive. 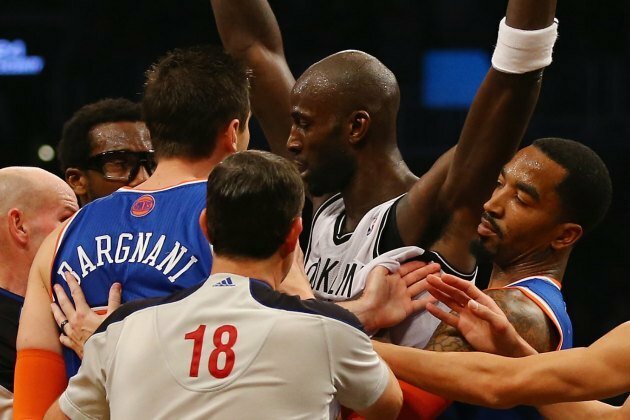 Nets have not won season series since the 2006-2007 season. Preview: This game definitely qualifies for must-watch status. 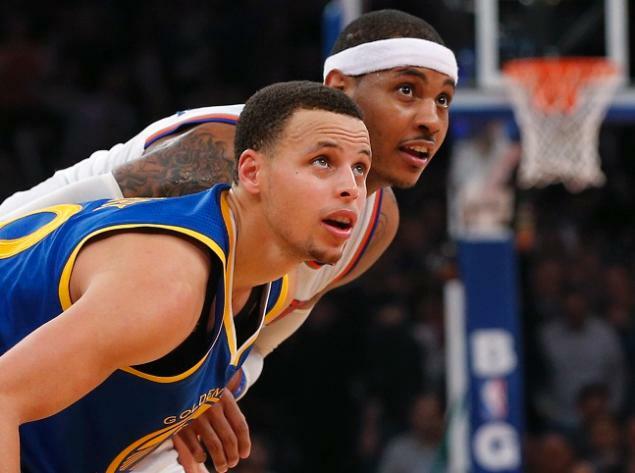 Stephen Curry will look to repeat the 54-point performance he put up in MSG a couple years ago, and the Knicks will be looking to avenge last year’s blowout on their home court. Former Knick David Lee should get a very warm reception in this one. Notes: Tickets expensive. Warriors’ only visit to MSG this season. Knicks 160-171 all-time vs Warriors. Notes: Tickets moderate. 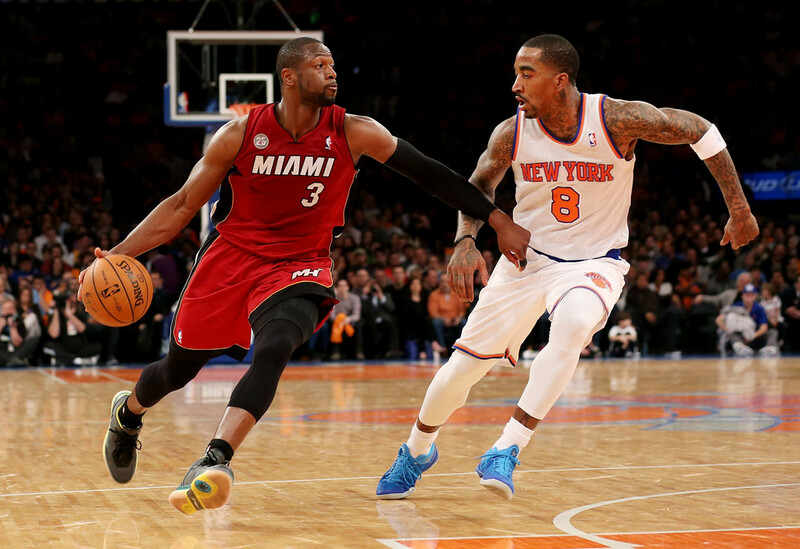 Knicks 59-46 all-time vs Heat. 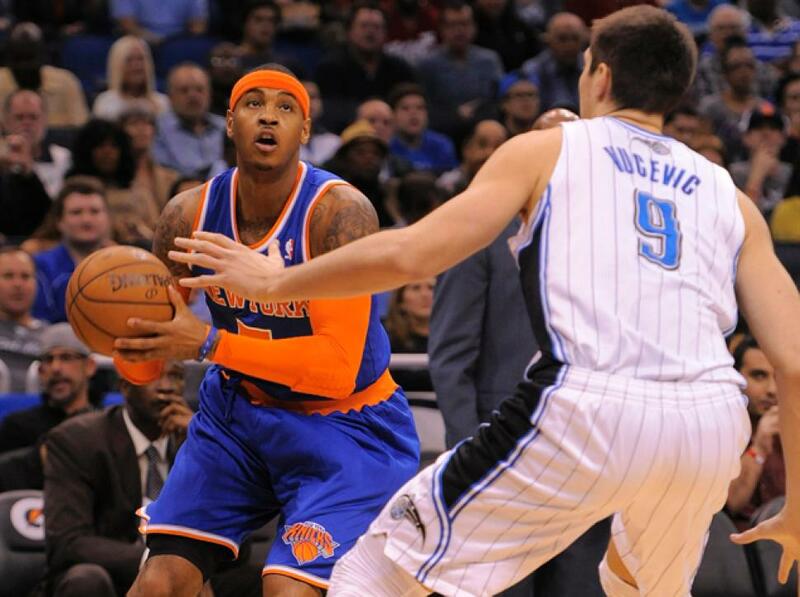 Preview: The Knicks will stay in Florida to face the Magic in their final game before the All-Star break. The Knicks should win, as long as they don’t start their vacations too early. 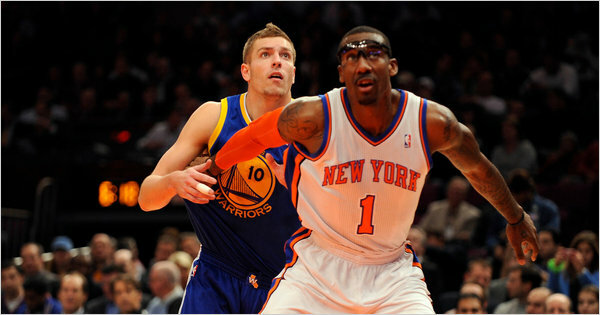 Preview: The Knicks will host the actual Game, while the Nets will host the other festivities such as the Dunk Contest. Notes: Tickets will be posted on the link above when we get access to them, but they will be very expensive. Saturday = Events, Sunday = All-Star Game. 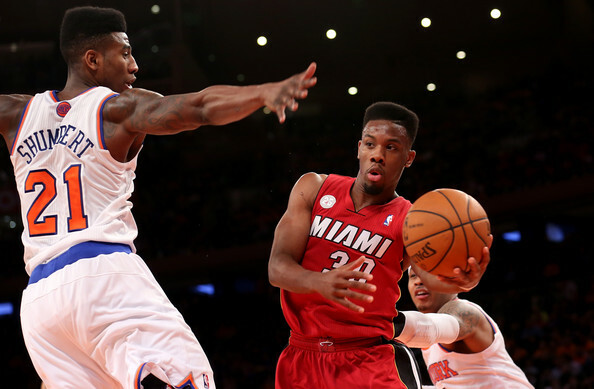 Preview: The Knicks will come out of the All-Star break with a tough game at home against the Heat. Iman Shumpert and Norris Cole will have a flat-top contest, while Melo battles with Wade and Bosh in an attempt to win the actual game. Notes: Tickets expensive. 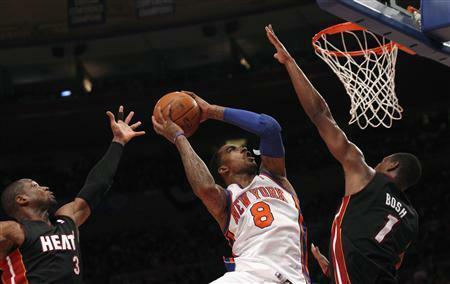 Heat won 5 straight games vs Knicks before signing LeBron James. 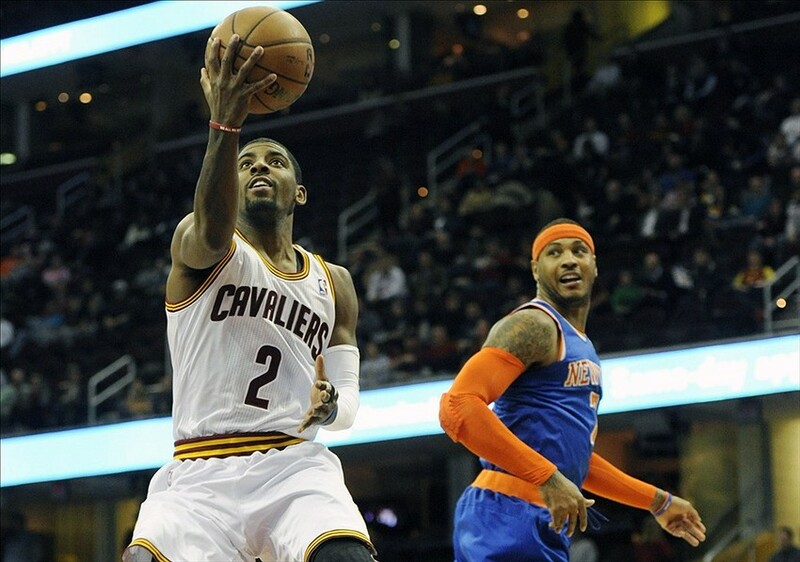 Preview: After hosting LeBron’s old team, the Knicks will host LeBron’s new team. Which is also his old team. It’s confusing. But not an easy start to the post-break portion of the schedule. Notes: Nationally televised game. Tickets through the roof. 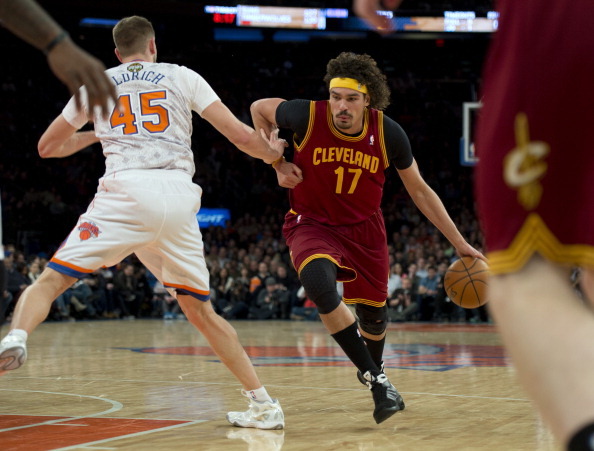 Cavaliers won final 8 games against Knicks before LeBron signed with Miami. Notes: Tickets moderate. 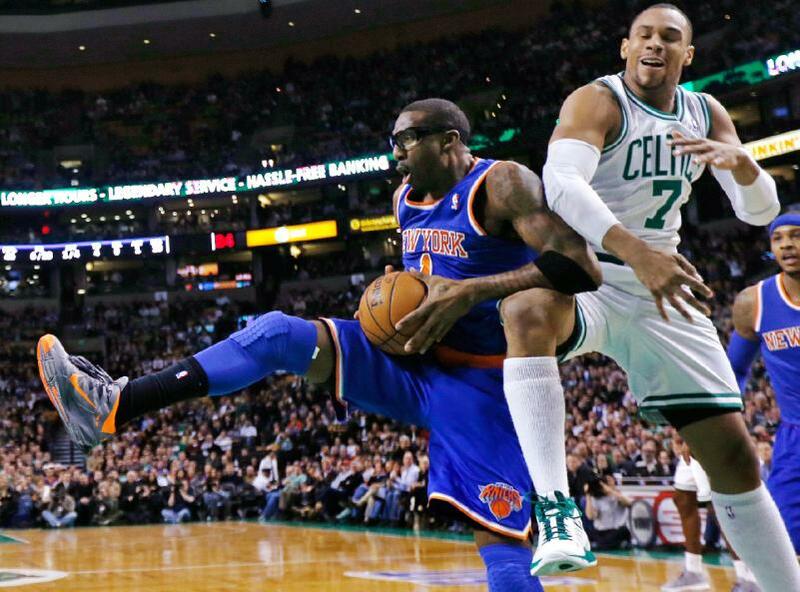 Knicks have played against the Celtics more than they have faced any other team. 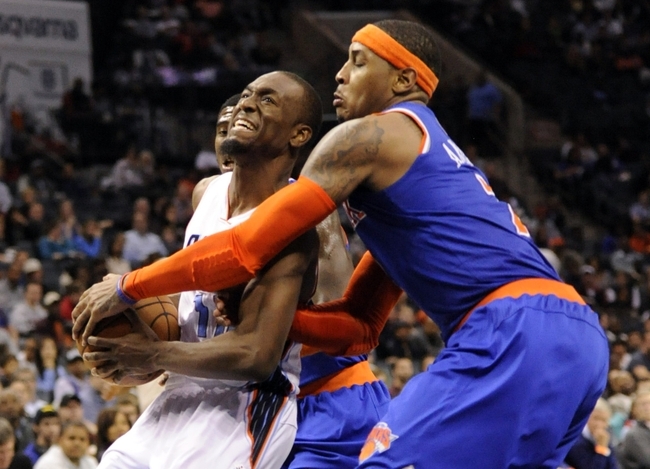 Preview: Another game the Knicks should win, but victory is far from certain. Luckily, there is no wild Detroit nightlife to distract JR.
Notes: Tickets cheap. 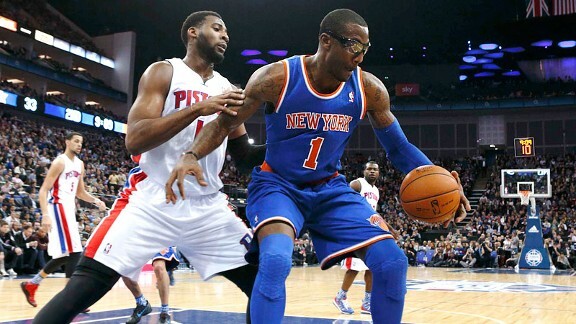 Knicks have played the Pistons more than they have faced any other team outside of the Atlantic Division. 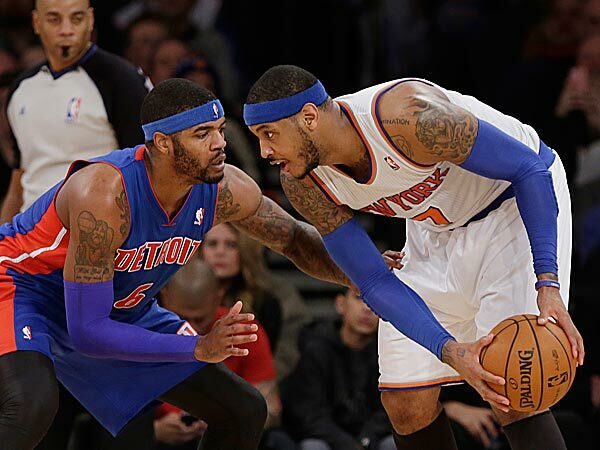 Preview: 2nd-half divisional battles like this are important, and the Knicks could really use a win in this game. It won’t come easily, but New York WILL be playing on its home floor. The Raps traded Novak, but they still have our old friend Landry Fields. Notes: Tickets moderate. Teams have split season series 3 years in a row. 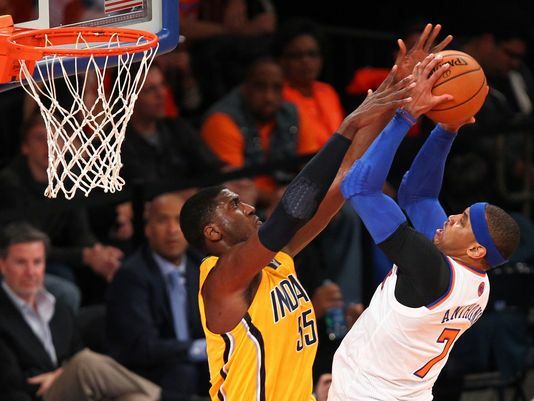 Preview: The Knicks will play their first game of the month of March in Indiana against a Pacers team which will be looking to have a much better second half than they did last season. This has developed into a pretty good rivalry recently, so it should be an intense one. Notes: Tickets cheap. Knicks 87-73 all-time vs Pacers. Preview: THE PRODIGAL SON RETURNS! 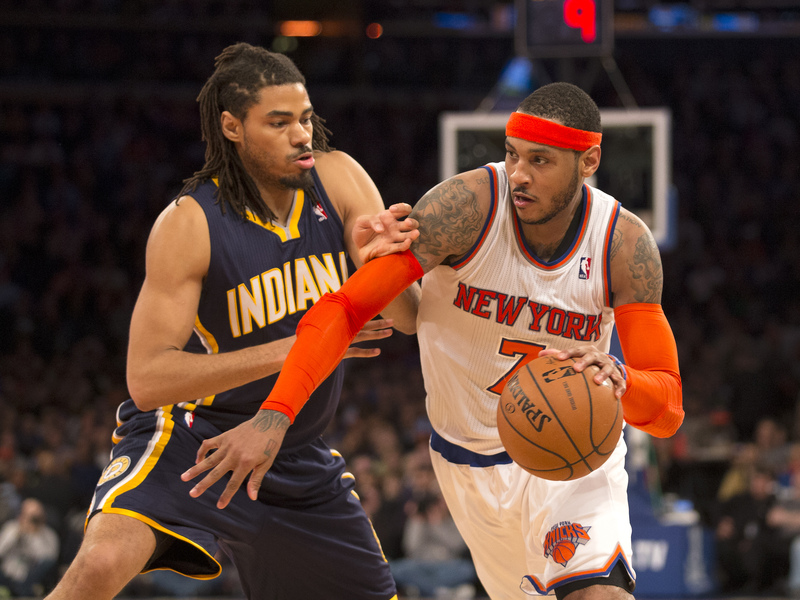 Chris Copeland will hit up the Garden for this game, the first Knicks-Pacers battle at MSG this season. Copeland could actually have an impact, too, with George’s injury and Stephenson’s departure clearing room for some minutes at the wing spots. The Knicks lost to the Pacers at the Garden last year on a terrible call from Joey Crawford, before pulling out a terrific home win later in the year. Notes: Tickets fairly expensive. 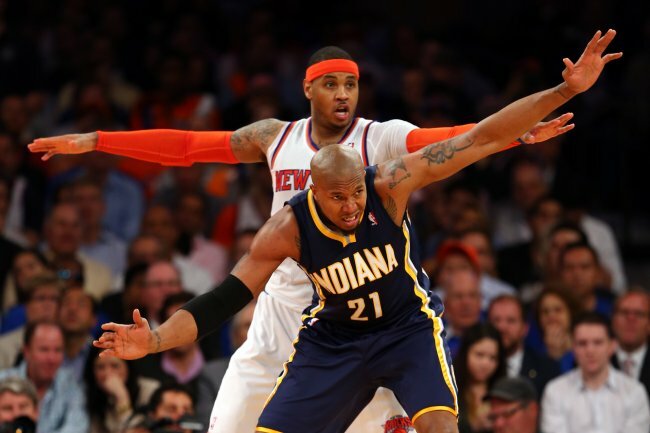 Pacers eliminated Knicks in 2013 playoffs. 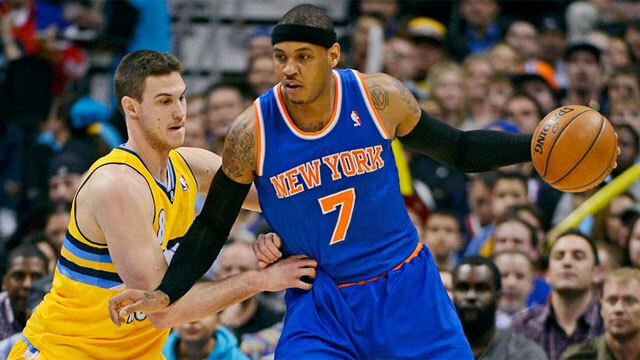 Game 62: Knicks @ Nuggets, Monday, Mar 9th, 9 PM. 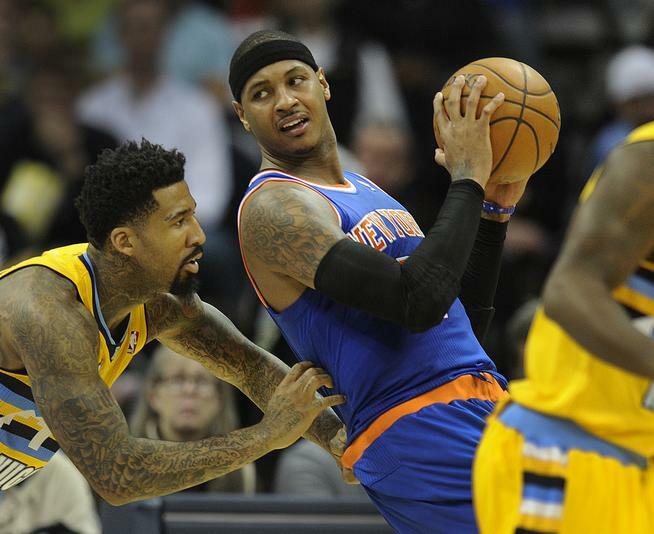 Preview: Melo’s yearly return to Denver is always fun, and he’ll be looking to silence the jeers of his former worshippers in this matchup. Also, JR Smith lives for the yearly Colorado trip. This game is the start of a lengthy West Coast Trip for the Knickerbockers. Notes: Tickets cheap. Knicks 42-37 all-time against Nuggets. 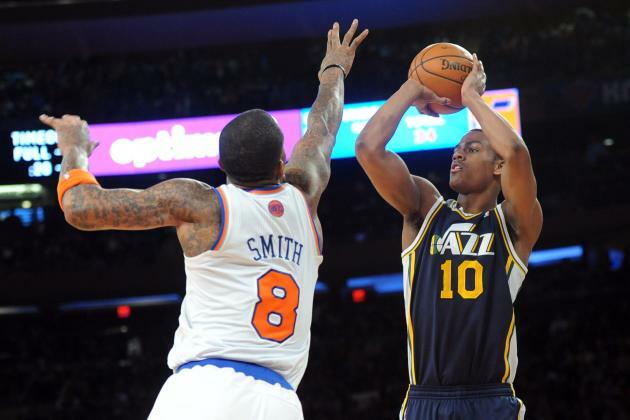 Preview: The second leg of the long West Coast swing will land the Knicks in Utah, where Tim Hardaway Junior will square off against his former Michigan teammate, Trey Burke. Timmy’s side should have the upper hand in this one. Notes: Tickets cheap. 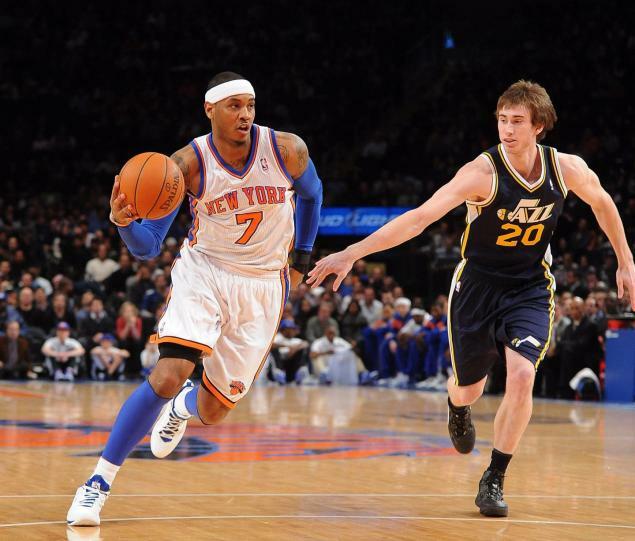 Knicks 46-42 all-time against Jazz. Preview: The two biggest markets in the NBA will collide when the Knicks visit the Lakers for this late-night matchup. 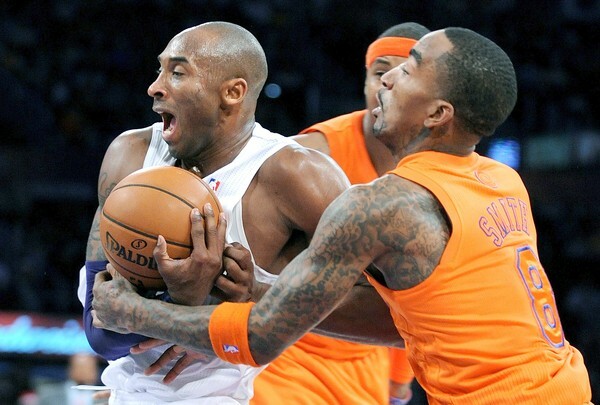 Last year’s game at the Staples Center was brutal, so the Knicks should have some extra motivation. Notes: Nationally televised game. Tickets moderate. 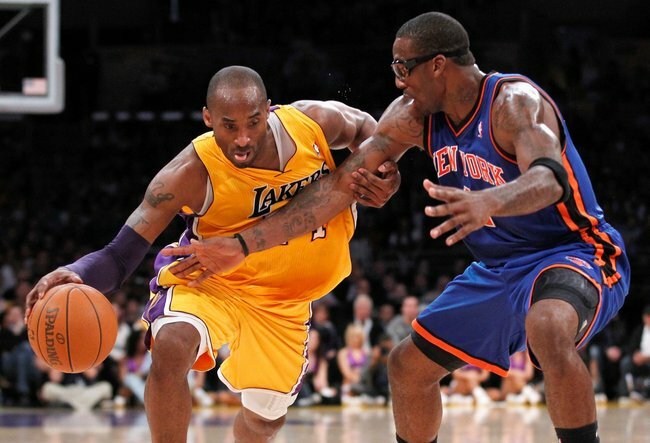 Knicks 114-165 all-time against Lakers, 2-1 against them in modern-era NBA Finals Series. Preview: This will be one of the most difficult games of the Knicks’ stay on the West Coast, with a loaded Warriors offense playing in front of their home fans. The Knicks won the matchup at the Oracle Arena last season, so don’t count them out of this one by any means. Notes: Tickets moderate. Knicks 160-171 all-time vs Warriors. 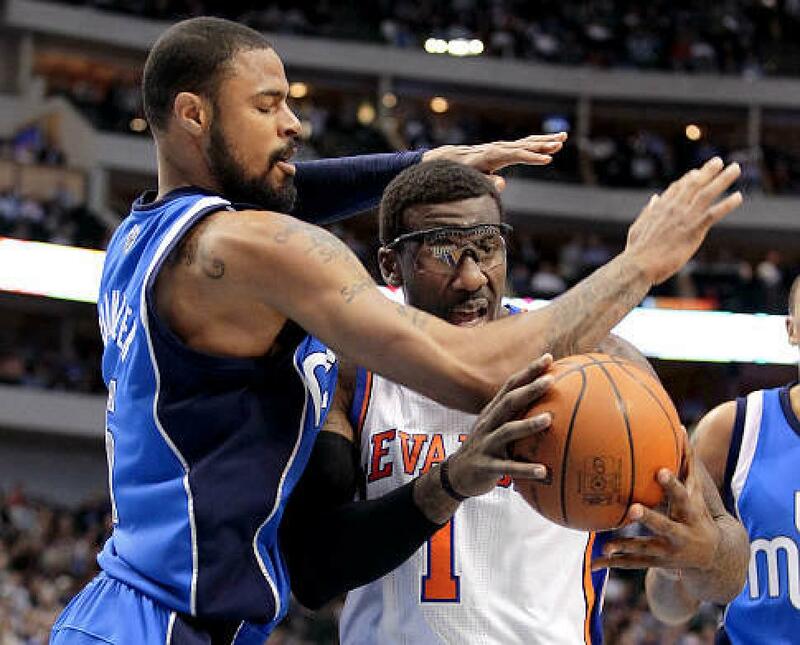 Preview: Amar’e Stoudemire will be returning to his old stomping grounds and probably deserves a good hand (I won’t make a hand-related joke here, I promise). But the Knicks will be looking to extinguish (whoops) the Suns’ home-court advantage by getting off to a quick start after an ugly loss at the US Airways Center last season. After the final buzzer, the Knicks will finally head back home. Notes: Nationally televised game. Tickets moderate. 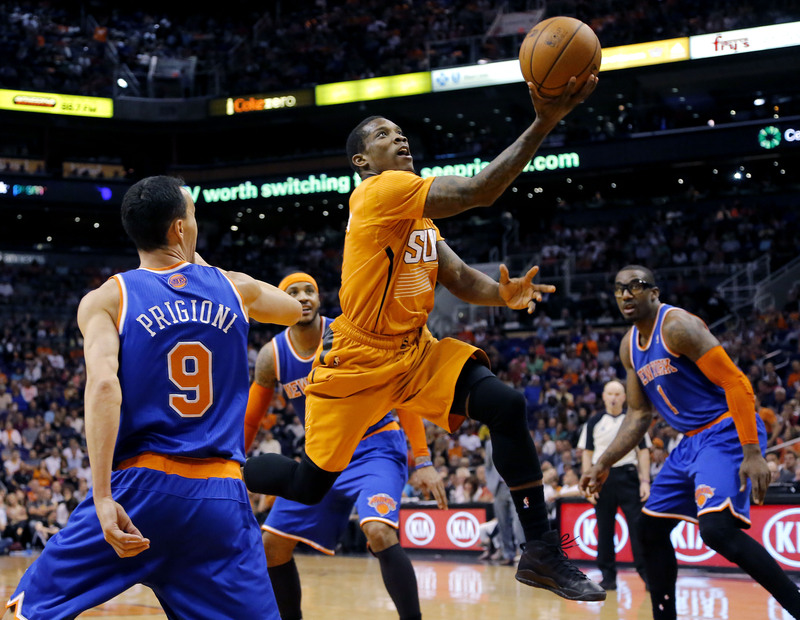 Knicks 60-58 all-time vs Suns. Preview: The Knicks will finally return from the West Coast for this game, but they’ll be hosting none other than the Western (and NBA) champions. Coach Popovich has a BIT more experience than Derek Fisher, so the Spurs will probably play a more sophisticated game. But it can’t possibly be worse than the last time San Antonio came to the Garden. Notes: Tickets expensive. Spurs’ only visit to MSG this season. 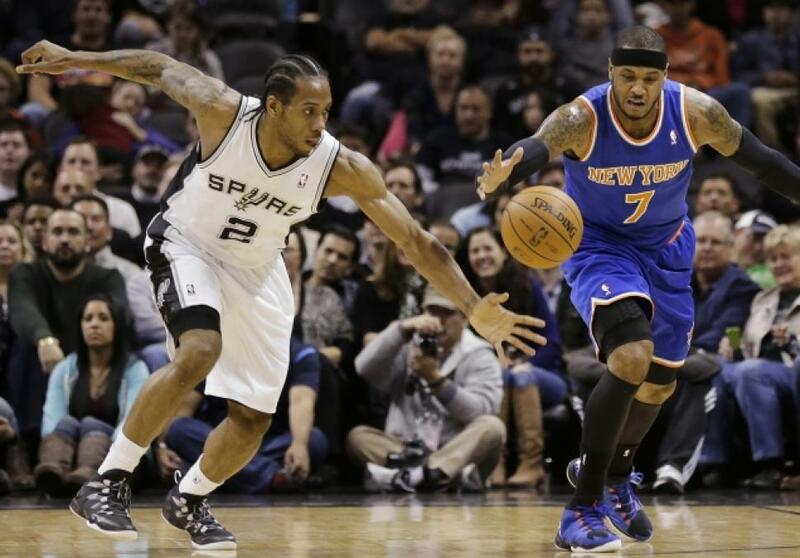 Knicks 37-46 all-time vs Spurs, lost to them in 1999 NBA Finals. Preview: Knicks fans won’t get to recruit Kevin Love, but they will get their first live look at Number 1 pick Andrew Wiggins, for whom Love was traded. That alone makes this a game to watch. After a long stay on the West Coast and a game against the defending champions, this is also a game the Knicks need to win. Notes: One of the cheapest games of the season. 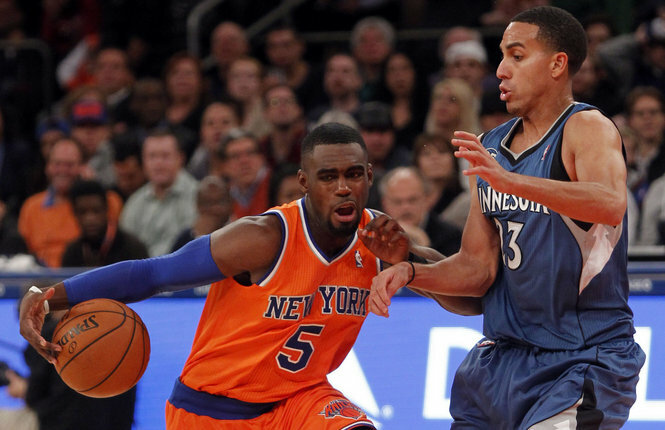 Timberwolves’ only visit to MSG this year. 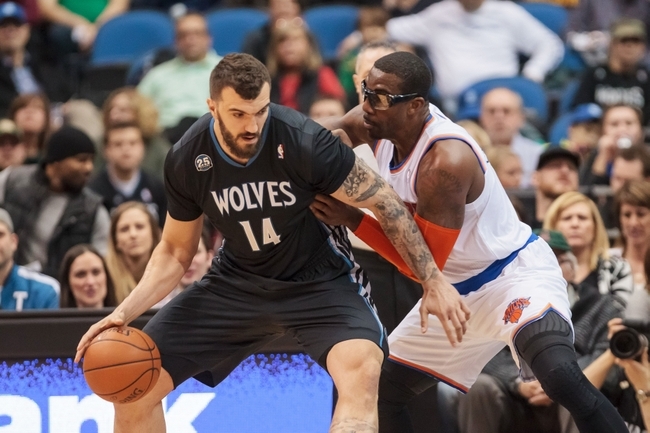 Knicks 28-20 all-time vs Wolves. Preview: Awesome, another game I can go to in Philly! There isn’t much else to look for, though, as the Sixers will likely be in full tank mode by this point in the season. Joel Embiid will possibly be back for this game, which would make things more interesting. Notes: Tickets moderate. Sixers have not won season series since 2008-2009 season. 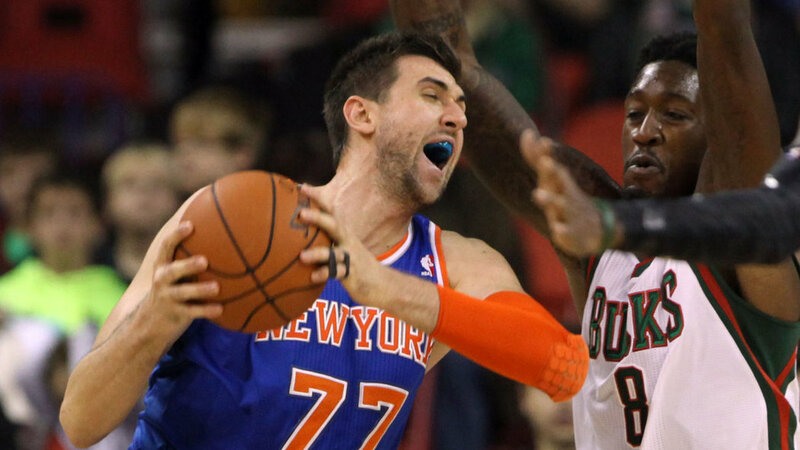 Preview: The Knicks will make the trip up to Canada to try to help their quest for the division in this matchup, and it will be another boo-fest for Bargnani, who will be looking to put up a triple-double. Hey, I can dream. Notes: Tickets moderate. Head-to-Head is the first tiebreaker in the division standings, and division winners are guaranteed a top-4 seed. 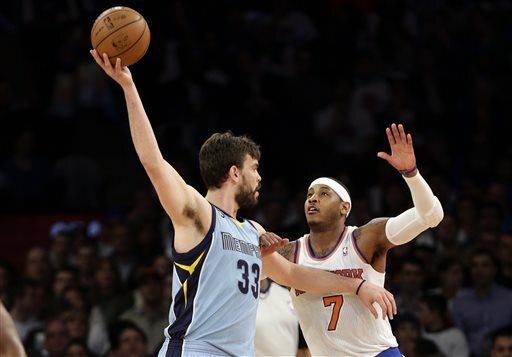 Preview: Well, this is our chance to recruit Marc Gasol, who many consider to be the ideal free agent target for the Knicks next offseason. We’ll also be hosting Former Knick Zach Randolph, who could have done us a favor by being half as good as he is now when he was with us. 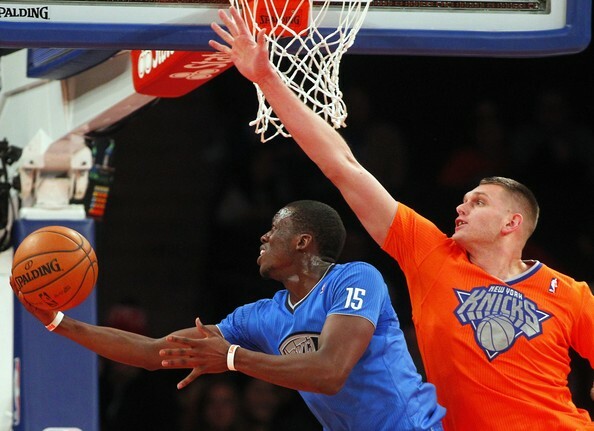 If the Knicks don’t box out Z-Bo, it’s gonna be a long day. Notes: Tickets moderate. Grizzlies’ only visit to MSG this season. Knicks 19-16 all-time vs Grizzlies. Preview: Ah, what could have been. Chris Paul wanted to be a Knick, but the Knicks didn’t have the assets or cap room to get him when he became available. Now CP3 will visit the Garden as an enemy, and he’ll look to put on a show with Blake Griffin and the rest of Doc Rivers’ crew. We saw what Blake did to Timofey Mozgov… Cole Aldrich might wanna sit this one out. Notes: Nationally televised game. Tickets fairly expensive. 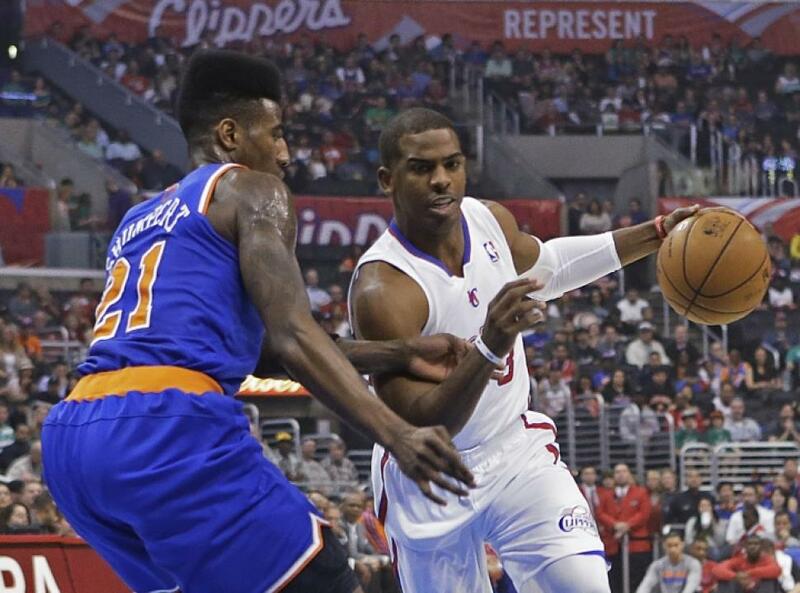 Clippers’ only visit to MSG this season. 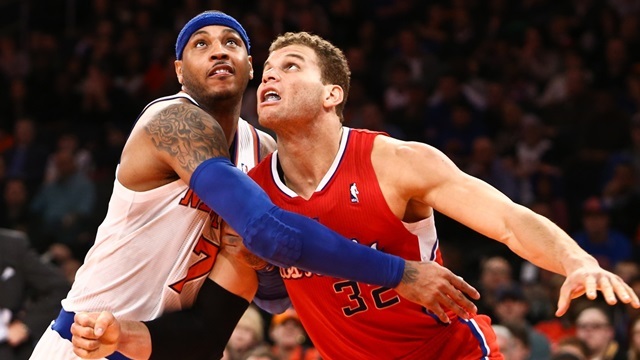 Knicks 69-51 all-time vs Clippers. Preview: Most people don’t expect the Celtics to contend for the division title this year, but if they do, that will add some extra intrigue to this matchup between rivals. Garnett and Pierce aren’t there to fuel the fire of hatred anymore, but the Celtics can still expect a hostile welcome in this one. Notes: Tickets cheap. The Knicks won 21 straight matchups between 1993 and 1998, but haven’t swept the season series since. Preview: This will be the final regular season battle between the Knicks and Bulls, and there is a good chance the Knicks will be looking to spoil the Bulls quest for a top-2 seed, while the Bulls will be trying to keep the Knicks out of the tournament altogether. No matter what the stakes, there is definitely going to be some serious animosity between the two teams, and the crowd won’t be very friendly, either. Notes: Tickets fairly expensive. The Bulls are 6-1 against the Knicks in playoff series. 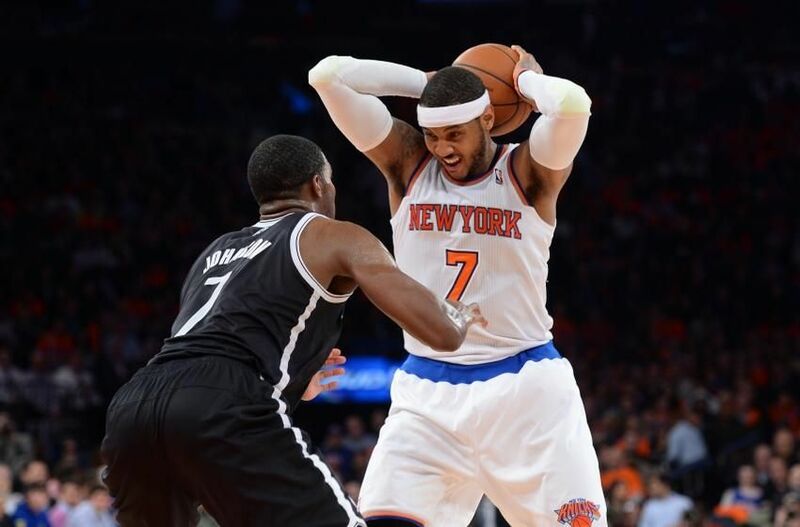 Preview: A playoff matchup between these two teams would be amazing, but unless that happens, this will be the final time the Knicks and Nets meet this season. The Knicks will be playing at home, and they might be fighting for divisional positioning depending on how the season plays out for the two teams. 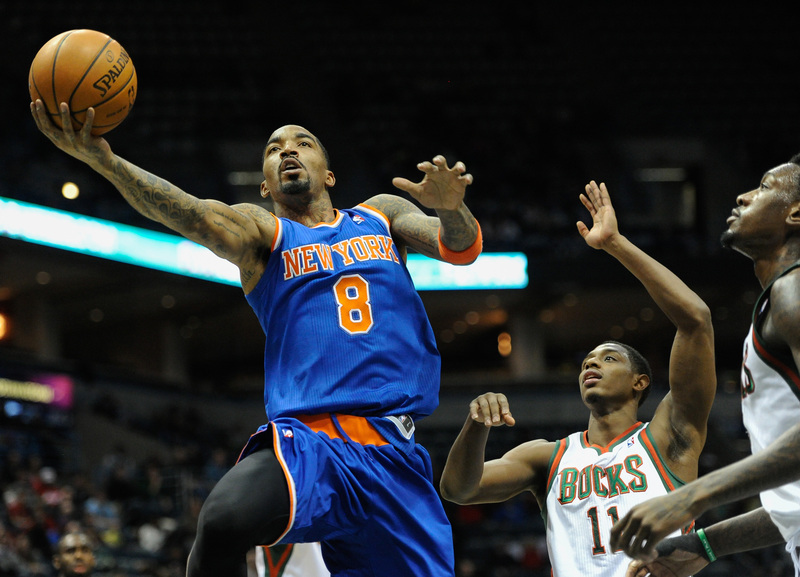 It will be April Fools’ Day, so JR Smith might untie a shoelace or two. Notes: Nationally televised game. Tickets expensive. Knicks are 5-5 against the Nets in playoff series. Preview: The Knicks’ season-ending string of Eastern Conference games will continue when they battle the Wizards for the final time. These teams are pretty evenly matched, which means they could be very close in the standings. Don’t be surprised if this ends up becoming a crucial game for one or both teams. Notes: Tickets moderate. 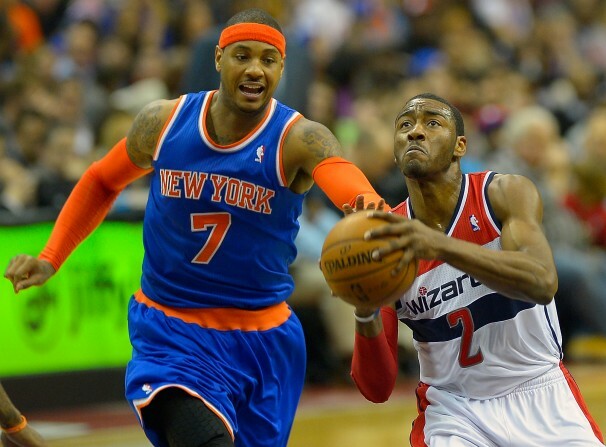 Knicks are 5-1 vs Wizards in playoff series. 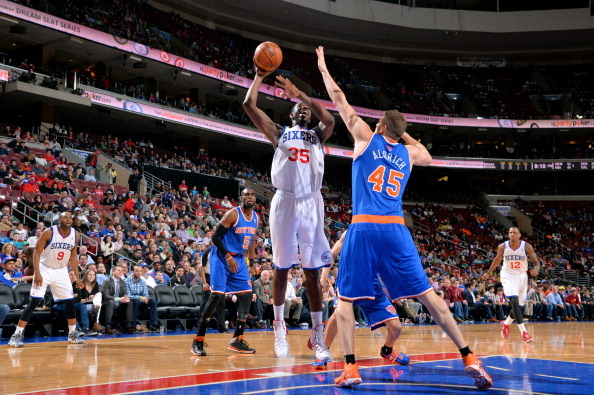 Preview: OK, this game is so late in the season that the 76ers might not even show up. But if they do, the Knicks can’t afford to lose this game, as they are likely to be battling for a playoff spot (or playoff seeding). Of course, it’s hard to beat a team four times, so even if the Knicks win the first three matchups, this might be a trap game. Notes: Tickets cheap. 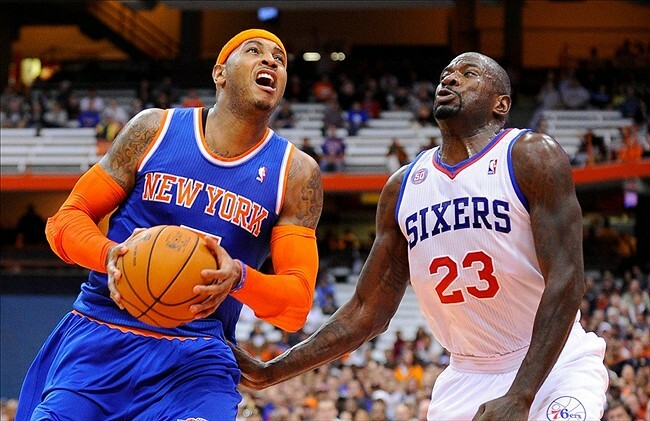 Knicks haven’t swept the 76ers in the season series since the 1994-1995 season. Preview: The Pacers were the 1 seed last year, but they’re unlikely to be positioned so comfortably down the stretch this time around. Expect another high-stakes game, and another close one, at that. Also, we will once again be on Cope Watch. Notes: Tickets moderate. 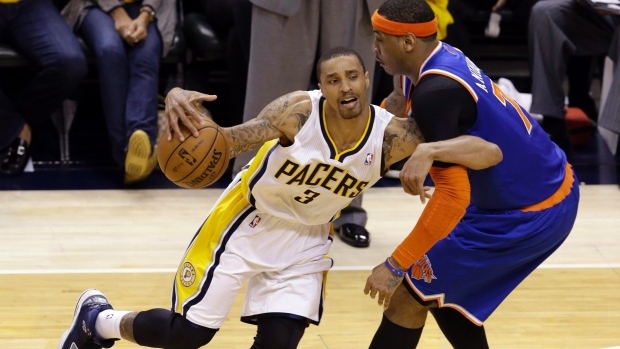 Knicks haven’t swept Pacers in season series since 1993-1994 season. 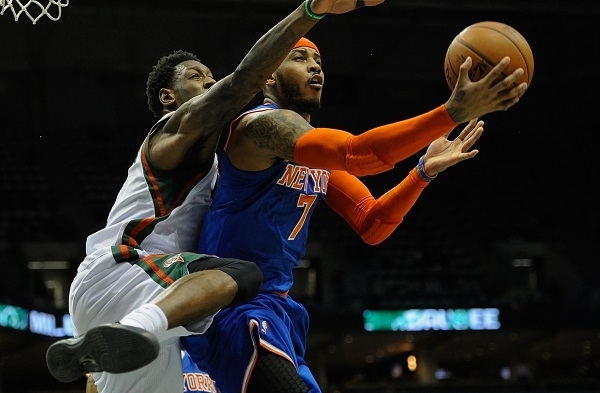 Preview: This will be a much-needed, easy late-season matchup for the Knicks. It will also be crucial on a personal level if my aforementioned Hat Bet comes down to the wire. The Knicks would do well to take care of business in this game, and in the next one as well. The Coach Fisher – Coach Kidd matchup should be fun to watch throughout the season series. Notes: Tickets moderate. Bucks Coach Jason Kidd played for the Knicks during the 2012-2013 season. Preview: Yep, back-to-back games against bottom-dwelling teams. Thank you, schedule-makers. 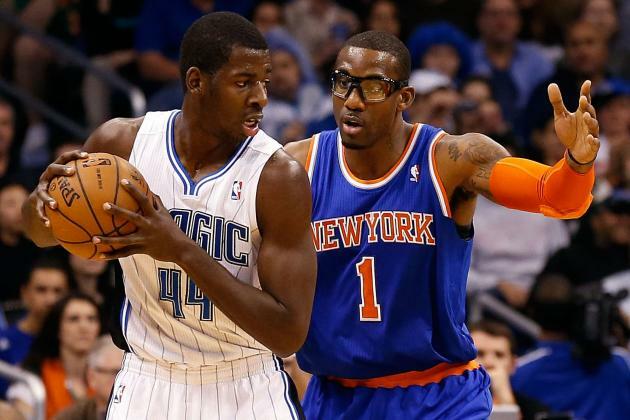 But the Magic haven’t been pushovers against us very often, so the Knicks will have to maintain focus. However, if the Knicks have already secured a playoff spot (and their seeding isn’t in flux), this might be a chance to take a look at some of the bench players. Notes: Tickets fairly expensive. 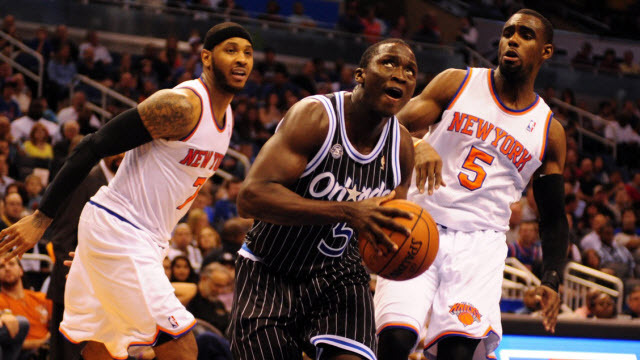 New York’s double-overtime loss in Orlando last season snapped an 8-game winning streak against the Magic. Preview: Boy, it would have been nice to have an extra matchup with the Hawks late in the season last year. If the Knicks and Hawks are battling it out in the standings again, this could be a must-win for both teams. Notes: Tickets fairly expensive. Final road game of the season. Preview: Ideally, this game will mean nothing, as the Knicks will have a nice playoff spot wrapped up by the time the regular season finale rolls around. But that might not be the case, and if the Knicks are fighting for their lives in the 82nd game, the Garden will have a playoff atmosphere. Hopefully it’s a “40 minutes from Cole Aldrich” kind of game, though. Notes: Tickets moderate. Final game of regular season. Location: Mohegan Sun Arena, Connecticut. Tickets: We do not have access to discounted tickets for this game. Stay tuned for more season preview posts. And again, this Schedule Guide is now available as a PAGE on our website, not just as an article! So you can find it whenever. And for tickets to ALL games, you can go here! Tommy if you did all of this. You are a GOD. Thank you, sincerely. Amazing. Thanks! Yeah I put it together over the course of a couple days, hope you all find it useful! and hassle inside long run.